The SISAL database: a global resource to document oxygen and carbon isotope records from speleothems The SISAL database Kamolphat Atsawawaranunt et al. Stable isotope records from speleothems provide information on past climate changes, most particularly information that can be used to reconstruct past changes in precipitation and atmospheric circulation. These records are increasingly being used to provide “out-of-sample” evaluations of isotope-enabled climate models. SISAL (Speleothem Isotope Synthesis and Analysis) is an international working group of the Past Global Changes (PAGES) project. The working group aims to provide a comprehensive compilation of speleothem isotope records for climate reconstruction and model evaluation. The SISAL database contains data for individual speleothems, grouped by cave system. Stable isotopes of oxygen and carbon (δ18O, δ13C) measurements are referenced by distance from the top or bottom of the speleothem. Additional tables provide information on dating, including information on the dates used to construct the original age model and sufficient information to assess the quality of each data set and to erect a standardized chronology across different speleothems. The metadata table provides location information, information on the full range of measurements carried out on each speleothem and information on the cave system that is relevant to the interpretation of the records, as well as citations for both publications and archived data. The compiled data are available at https://doi.org/10.17864/1947.147. Atsawawaranunt, K., Comas-Bru, L., Amirnezhad Mozhdehi, S., Deininger, M., Harrison, S. P., Baker, A., Boyd, M., Kaushal, N., Ahmad, S. M., Ait Brahim, Y., Arienzo, M., Bajo, P., Braun, K., Burstyn, Y., Chawchai, S., Duan, W., Hatvani, I. G., Hu, J., Kern, Z., Labuhn, I., Lachniet, M., Lechleitner, F. A., Lorrey, A., Pérez-Mejías, C., Pickering, R., Scroxton, N., and SISAL Working Group Members: The SISAL database: a global resource to document oxygen and carbon isotope records from speleothems, Earth Syst. Sci. Data, 10, 1687-1713, https://doi.org/10.5194/essd-10-1687-2018, 2018. Table 1Information on speleothem records (entities) in the SISAL_v1 database. Elevation (Elv) is given in metres above sea level and latitude (Lat) and longitude (Long) in decimal degrees. For convenience, we have given the location of each record, although this information is not available in the database itself. Note that the latitude and longitude of Abaliget, Brown's cave and Uamh an Tartair are given correctly here but are incorrect in the SISAL_v1 database. Speleothems are inorganic carbonate deposits (mostly calcite and aragonite) that grow in caves and form from drip water supersaturated with respect to CaCO3. Speleothems are highly suitable for radiometric dating using uranium-series disequilibrium techniques. Since they form through continuous accretion, speleothems can provide a highly resolved record of environmental conditions, generally with a temporal resolution ranging from seasonal scale to 100 years, depending on sampling resolution. Speleothem records are one of the types of record widely used to reconstruct past climate changes (see Bradley, 2015 for an overview of other methods). Speleothem growth is, in itself, an indicator of precipitation availability (Ayliffe et al., 1998; Wang et al., 2004), and variations in annual growth increments have been interpreted as an index of precipitation amount (Fleitmann et al., 2004; Polyak and Asmerom, 2001; Trouet et al., 2009). Many different types of measurements have been made on speleothems, but the most common are the stable isotopes of oxygen and carbon (δ18O, δ13C). Although the interpretation of such records can be complicated, for samples that are deposited close to equilibrium, changes in δ18O are primarily a signal of changes in precipitation amount and source, precipitation temperature, and cave temperature (Affek et al., 2014; Hu et al., 2008; McDermott, 2004; Wang et al., 2008) and have been widely used to reconstruct changing atmospheric circulation patterns (e.g. Bar-Matthews et al., 1999; Cai et al., 2012, 2015; Luetscher et al., 2015; Spötl and Mangini, 2002; Trouet et al., 2009). Changes in δ13C are a more indirect signal of precipitation changes. If not affected by non-equilibrium deposition (Baker et al., 1997), δ13C can reflect the changing abundance of C3 and C4 plants above the cave (Baldini et al., 2008; Dorale et al., 1998) or the availability of soil CO2 during the dissolution of limestone (Genty et al., 2003; Hendy, 1971; Salomons and Mook, 1986). Speleothem records are widely distributed geographically, and this makes them an ideal type of archive for regional climate reconstructions. An increasing number of climate models explicitly simulate water isotopes as a tool for characterizing and diagnosing the atmospheric hydrological cycle (Schmidt et al., 2007; Steen-Larsen et al., 2017; Sturm et al., 2010; Werner et al., 2011; Haese et al., 2013). Such models are evaluated against modern observations of the isotopic composition of rainwater (see for example Yoshimura et al., 2008; Steen-Larsen et al., 2017). However, evaluations against palaeo-records such as the δ18O records from speleothems can be used to provide an “out-of-sample” test (Schmidt et al., 2014) of these models. Thus, in addition to their use for climate reconstruction, speleothem records are a useful addition to the tools that are used for climate-model evaluation. More than 500 speleothem data sets have been published to date, 70 % of which have been published in the decade since 2007. There have been some attempts to provide syntheses of speleothem data, particularly in the context of providing climate reconstructions or data sets for model evaluation (e.g. Bolliet et al., 2016; Caley et al., 2014; Harrison et al., 2014; Shah et al., 2013). However, these compilations generally lack sufficient information to allow careful screening of the records to ensure the reliability of the climate interpretation or the quality of the dating of the record. Furthermore, none of them provide comprehensive coverage of the globe. SISAL (Speleothem Isotope Synthesis and Analysis) is an international working group set up in 2017 under the auspices of the Past Global Changes (PAGES) programme (http://pastglobalchanges.org/ini/wg/sisal, last access: 4 September 2018). The aim of the working group is to compile the many hundreds of speleothem isotopic records worldwide, paying due attention to careful screening and metadata documentation, the construction of standardized age models, and age-model uncertainties, in order to produce a public-access database that can be used for palaeoclimate reconstruction and for climate-model evaluation. In this paper, we document the first publicly available version of the SISAL database, focusing on describing its structure and contents including the information that has been included to facilitate quality control. The database contains stable carbon and oxygen isotope measurements made on speleothems, as well as supporting metadata to facilitate the interpretation of these records. All available speleothem data are included, and no attempt was made to screen records on the basis of the time period covered, the resolution of the records, or the quality of the data or age models. Adequate metadata are provided to allow database users to select the records that are suitable for a particular type of analysis. The raw data were either provided by members of the SISAL working group or extracted from data lodged in PANGAEA or from the National Centres for Environmental Information. Additional information on the records was compiled from publications. All the records in the current version of the database (SISAL_v1) are listed and described in Table 1. The data are stored in a relational database (MySQL), which consists of 14 linked tables, specifically site, entity, sample, dating, dating lamina, gap, hiatus, original chronology, δ13C, δ18O, entity link reference, reference, composite link entity and notes. Figure S1 shows the relationships between these tables. A detailed description of the structure and content of each of the tables is given below. The details of the pre-defined lists for all fields can be found in Table S1. A site is defined as the cave or cave system from which speleothem records have been obtained. A site may therefore be linked to several speleothem records, where each record is treated as a separate entity. The site table contains basic metadata about the cave or cave system, including site ID, site name, latitude, longitude, elevation, geology, rock age and monitoring (see Table S2). The elevation is that of the cave itself, not the elevation of the land surface above the cave. Since the elevation of the land surface can be obtained from other sources, we include the cave elevation to facilitate making additional lapse rate corrections for oxygen isotopes for high elevation sites (Bowen and Wilkinson, 2002). This also allows an estimation of the depth of the overburden above the speleothem site, and hence an estimate of the time taken for water to reach the cave. The description of the geology and the age of the rock formation (rock_age) is given because this is important for understanding the degree of permeability of the material above the cave. Primary porosity decreases and fracture flow increases as rocks age, which in turn affects the likely speed at which water flows through the host rock and reaches the cave system. The geology field is also useful because it gives an indication of whether the cave is formed in Mg-rich rocks (e.g. dolomite) and thus whether the speleothems are likely to be formed of aragonite, which would require special consideration in terms of oxygen and carbon isotope comparisons with that of calcite (see also Table S3). Only a limited number of descriptive terms are allowed for each field. The age of rock formation follows the standard era, period, epoch terminology as defined by the International Commission on Stratigraphy in 2015 (Cohen et al., 2015). The database includes information on whether the cave site has been monitored: positive returns in this field mean that monitoring of in-cave environmental parameters (e.g. cave air temperature) and/or cave drip chemistry has been carried out periodically for at least one entire season (as opposed to one-off measurements of in-cave conditions when the speleothem was collected). The database does not contain monitoring data, but inclusion of this field facilitates researchers being able to contact the original data providers about monitoring information, which can be useful in understanding if a cave is likely to contain speleothems that have been deposited close to isotopic equilibrium. Each speleothem (or composite speleothem record) has a unique identifier and a unique name. The entity metadata table (Table S3) provides information on the cave environment that can affect speleothem formation. This includes the thickness of the cover above the speleothem, which might affect the time taken for water to reach the drip site feeding the speleothem and hence the responsiveness of the record to individual rain events or seasonal patterns of precipitation (Fairchild and Baker, 2012). The distance of the speleothem from the cave entrance is provided, which, depending on the morphology of a cave, can be a useful indicator of cave ventilation (direct air advection). Ventilation is important as it can control cave air temperature, humidity, evaporation and pCO2 levels (Fairchild and Baker, 2012; Frisia et al., 2011; Spötl et al., 2005; Tremaine et al., 2011). The entity table also contains a field to document whether any tests have been carried out to establish whether there is oxygen and carbon isotope quasi-equilibrium between the drip water (CO2–H2O system) and the speleothem (CaCO3). There are several such tests (see for example Hendy, 1971; Johnston et al., 2013; Mickler et al., 2006; Tremaine et al., 2011), but no attempt is made to identify which test has been applied in the database. The drip type (e.g. seepage flow, seasonal drip, vadose flow; Smart and Friederich, 1987) also provides useful hydrological information: seepage flow shows a small inter-annual variability of discharge and the speleothem record will therefore more likely reflect a long-term average state over several years; other drip types, such as seasonal drip, will indicate the potential to record seasonal or individual rainfall events. The main focus of the SISAL database is stable isotope measurements, but the entity metadata table also contains information on the kinds of measurements that have been made for a specific speleothem. Only the stable isotope measurements are currently archived in the database. However, listing the range of data available from any speleothem will facilitate future updates of the database to include other types of measurements apart from stable isotopes (i.e. trace elements) and will help researchers in locating speleothems where multiple types of measurements have been done. The entity metadata table contains four fields to facilitate data traceability. The first two fields give the name of the person who was responsible for collating the data, and a DOI or URL for the original data. Some records have been partially or entirely updated since first being published. Although these records are included for data traceability, the entity_status field indicates whether they have been partially updated (e.g. with additional samples and/or improved age models) or completely superseded by a new record. The field corresponding_current indicates which entity (or entities) provides updated information. Information on original publications on specific speleothems is given in the reference table (see Sect. 2.2.11). The sample metadata table (Table S4) contains information on the location of the sample with respect to a reference point, where the reference point can be either the top or the base of the speleothem. It also provides information on the thickness and mineralogy (calcite, secondary calcite, aragonite, vaterite, mixed, not known) of each sample. Since some samples may have mixed mineralogy, it also provides information on whether a correction for aragonite has been applied to δ18O or δ13C, due to different phosphoric acid fractionation factors. The dating information table (Table S5) provides information on the radiometric dates used to construct the original age model for each of the speleothem entities, including type of radiometric date (e.g. U series), depth of dated sample, thickness of dated sample and sample weight. Dates that are used to anchor sequences that are dated by lamina counting (see Sect. 2.2.5) are included in the dating information table and identified in date type as an event (i.e. the start or end of a laminated sequence). The degree of precision varies between different dating methods and techniques, for example mass spectrometric U∕Th dating generally produces a more precise age than the alpha spectrometry U∕Th data method. So the inclusion of the dating method provides a basic measure of the reliability, in terms of analytical precision, of any given date. Sample thickness also influences the dating uncertainty, because thicker samples will integrate more material of different age. Similarly, sample weight can influence precision: samples younger than a few thousand years may contain very low levels of the daughter isotope 230Th (whose accumulation by radioactive decay provides the measure of the sample's age), and so require more material to provide an accurate and precise result. The content of 232Th is included in the dating information table because this value is used for the detrital correction of initial 230Th. Sample mineralogy is also included because this affects the reliability of individual dates (e.g. samples from re-crystallized secondary calcite are not reliable because of the loss of uranium; Bajo et al., 2016). We provide both the original uncorrected age and the corrected age for each date. The corrected U∕Th age is adjusted for detrital contamination; the corrected calibrated 14C age is adjusted for dead carbon. The correction factors used to derive the corrected U∕Th or 14C age are included in the dating information table. The decay constant used to calculate the U∕Th ages is given because the values used have changed through time (Cheng et al., 2000, 2013; Edwards et al., 1987; Ivanovich and Harmon, 1992). The calibration curve used to convert radiocarbon ages to calendar years in the original publication is also given. Several different standards have been used in the original publications for the modern reference state (e.g. BP(1950), b2k, CE ∕ BCE or the year when U∕Th chemical separation was performed) but all of these have been converted to BP(1950) in the database. Some of the dates listed for a given entity were not used in the original age model, for example because the dating sample was contaminated with organic material or because of age inversions. The dates excluded from the original age model are flagged in the database (date_used) but the other information on these dates is nevertheless included in the dating information table to ensure transparency. The geochemical characteristics of the sample provide information that is required to assess the quality or reliability of these dates. The ratio of 230Th ∕ 232Th, for example, is a measure of detrital thorium concentration in the sample and thus provides an initial quality control on each date. A 230Th ∕ 232Th activity ratio > 300 is considered a good indicator of a reliable date (Hellstrom, 2006); a higher ratio indicates a cleaner sample with higher accuracy. The thorium corrected errors are also included to provide an indication of the magnitude of the correction related to detrital thorium contamination. Variations in the drip-water geochemistry and/or quantity or cave conditions may occur at regular intervals, forming laminae of a range of thicknesses usually linked to surface seasonal climate variations (Fairchild and Baker, 2012). A high-resolution chronology can be established for such records by lamina counting, provided an absolute date is available for either the start or the end of the laminated sequence (e.g. because U∕Th dates have been obtained or because the stalagmite was actively growing when collected). The identification of individual lamina can be difficult if they are very thin or of varying width, so best practice is to provide an estimate of the counting uncertainty that propagates from the absolute anchor dates. The lamina dating information table (Table S6) provides the age of each lamina in the sequence and the uncertainty on this dating; the absolute dates used as anchor points are given in the dating information table and identified in the date type field there as an event (see Sect. 2.2.4). It should be noted that laminae can be formed on a variety of timescales, depending on the frequency that the thresholds for the formation of specific fabrics and mineralogies are crossed. Annual laminations are more likely in regions where there is a clear seasonality in climate or cave environment. In other regions, the lamination may be a result of lower- or higher-frequency variations in, for example, hydrologically effective precipitation (e.g. infiltrated waters) or soil CO2 production. It is imperative to demonstrate that the laminations are annual (see Table S9) before using lamina counting for dating. A prolonged cessation of speleothem growth can occur under unfavourable environmental conditions leading to, for example, undersaturation of drip water or cessation of dripping. Growth hiatuses can often be recognized from structural or mineralogical features, or inferred based on absolute dating. Growth hiatuses have to be taken into account in the construction of age models and thus the hiatus place mark table (Table S7) provides information on the location of such features. The hiatus is referenced to the specific depth at which it occurs, and this depth is considered as an imaginary sample that then appears with a specific sample_id in the sample table. There are some cases in which the hiatus depth was not recorded; in these cases the depth was specified as the imaginary mid-point depth between bracketing samples. When a composite record is created based on more than one individual speleothem from the same cave system, there may be discontinuities in the overlapping time of the individual records. These gaps are not growth hiatuses, but must be identified to facilitate plotting of the records. The gap place mark information table (Table S8) provides information on the location of sample gaps. The gap is referenced to the specific depth at which it occurs, and this depth is considered as an imaginary sample which then appears with a specific sample_id in the sample table. In composite records where sample depths are not given, the location of a gap can be derived from the sample ordering and the absence of isotopic information for a given sample. In point of fact, this table is empty in version 1 of the database. The original chronology table (Table S9) provides an estimate of the age and age uncertainty, according to the original published age model for each sample on which stable isotope measurements have been made. The table also provides information on the type of age model (e.g. linear interpolation between dates, polynomial fit, Bayesian, StalAge; Scholz and Hoffmann, 2011, COPRA; Breitenbach et al., 2012, OxCal; Bronk Ramsey, 2001, 2008) used in the original publication. The fields ann_lam_check and dep_rate_check are included for quality assurance purposes, since they indicate that the assumption that laminae are truly annual has been explicitly tested. The carbon isotope data table (Table S10) contains the carbon isotope measurements. It also provides information on the laboratory precision of each measurement and the standard (PDB or Vienna-PDB) used as a reference. The oxygen isotope data table (Table S11) contains the oxygen isotope measurements. It also provides information on the laboratory precision of each measurement and the standard (PDB or Vienna-PDB) used as a reference. This table (Table S12) provides full bibliographic citations for the original references documenting the speleothems, their isotopic records and/or their age models. References on monitoring of the cave may also be provided. There may be multiple publications for a single speleothem record, and all of these references are listed. For convenience, there is also a table (Table S13) that links the publications to the specific entity. The notes table (Table S15) is provided in order to record additional information regarding the site which cannot be recorded in the fields of the table; this may also include entity specific information. Individual records in the SISAL database were compiled either by the original authors or from published and open-access material by specialists in the collection and interpretation of speleothem records. In this latter case, the data compilers made every attempt to contact original authors to check that the compiled data were correct. The name of the person who compiled the data is included in the database (entity table, contact) so that they can be consulted in the future about queries or corrections. Individual records for the database were subsequently checked by a small number of regional coordinators, to ensure that records were being entered in a consistent way. Prior to entry in the database, the records were automatically checked using specially designed database scripts (in Python) to ensure that the entries to individual fields were in the format expected (e.g. text, decimal numeric, positive integers) or were selected from the pre-defined lists provided for specific fields. In defining both the formats and the pre-defined lists, the SISAL working group has taken special care to ensure that the entries are unambiguous. Null values for metadata fields were identified during the checking procedure, and checks were made with the data contributors whenever possible to ensure that null fields genuinely corresponded to missing information. The database contains information designed to allow an assessment of the quality of an individual record. Thus, the entity metadata table contains information on, for example, the distance of the speleothem from the cave entrance in order to allow the user to assess whether cave temperatures are driven by advection of air or conduction through the bedrock. There are several other factors that can affect ventilation, for example the contrast between the cave and external climates, and cave morphology such as the size of the entrance or the number of entrances. Information on these factors is only rarely given in publications; we assume that this information would be more likely to be available if the original authors thought that ventilation was a significant influence on the speleothem record. Including information on distance from the cave entrance is therefore being regarded as a minimal indicator for record quality. Other fields that are included to allow the user to select appropriate records include geology, rock age, speleothem type and drip type. The database also contains information to allow an assessment of the reliability of the dates used in constructing the original age model. The most important of these fields are those with information on the sample geochemistry (see Sect. 2.2.4), which allows the user to determine whether the samples were sufficiently large and sufficiently pure to yield good U∕Th dates. The database also gives information on sample weight, which also addresses this issue. The information on the corrections employed, dating uncertainties and whether the original authors considered the date reliable (and therefore used it in constructing an age model) also provide insights into the reliability of individual chronologies. The SISAL database is an ongoing effort and continuing efforts to update the records will include updating missing data fields for individual records. Analysis of the data is also useful for verification purposes and may result in corrections of some data. Any such changes to sites and entities included in version 1 of the database will be documented in subsequent updates. The SISAL working group also aims to provide new chronologies in future versions of the database based on Bayesian approaches, namely OxCal (Bronk Ramsey, 1995, 2008), COPRA (Breitenbach et al., 2012) and StalAge (Scholz and Hoffmann, 2011). Figure 1Map of the location of sites in the database. Note that some sites include records for multiple individual speleothems, which are treated as separate entities in the database itself. The sites are coded with different shapes to indicate whether they provide records only for oxygen isotopes, or for both oxygen and carbon isotopes. Figure 2Plot showing the temporal coverage of individual entities in the database. 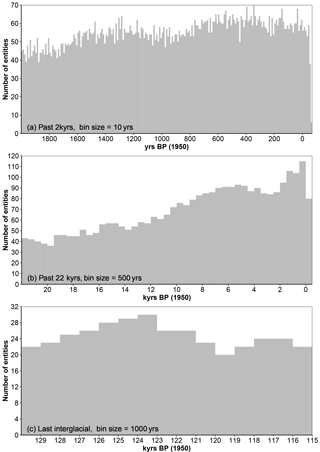 Panel (a) shows records covering the past 2000 years (2 kyr BP), (b) shows records covering the past 22 000 years (22 kyr BP), and (c) shows records that cover the LIG (130–115 kyr BP). The first version of the SISAL database contains 211 022 δ18O measurements, 127 115 δ13C measurements from 371 speleothem records and 10 composites from 174 cave systems. This represents approximately 58 % of published speleothem records we have identified. Of the 371 speleothem records, 8 have been superseded, 7 provide information for which there are also updates or additional information recorded as separate entities, 6 have dating information but no isotopic records because the individual entities were only used to construct composite records, and 15 do not have age models. The database also contains 6 records that have not been published. The distribution of sites is global in extent (Fig. 1). The majority (30 %) of the sites are from Europe (53 sites) and there is currently less good representation of sites from other regions. The temporal distribution of records is excellent for the past 2000 years (Fig. 2a) and good for the past 22 000 years (Fig. 2b). Altogether, 142 entities record some part of the past 2000 years, 87 of which have a resolution ≤10 years between samples on average. There are 253 entities recording some part of the past 22 000 years, including 153 with a resolution of ≤100 years between samples on average. The database contains 42 entities from the last interglacial period (115 000 to 130 000 years before present), 41 of which have a resolution of ≤1000 years between samples on average (Fig. 2c). The database is available in SQL and CSV format from https://doi.org/10.17864/1947.147 (Atsawawaranunt et al., 2018). The CSV format of the database is also available from https://www.ncdc.noaa.gov/paleo/study/24070 (last access: 4 September 2018). The SISAL database is based on a community effort to compile isotopic measurements from speleothems to facilitate palaeoclimate analysis. Considerable effort has been made to ensure that there is adequate metadata and quality control information to allow the selection of records appropriate to answer specific questions and to document the uncertainties in the interpretation of these records. The database is publicly available. The first version of the SISAL database contains 211 022 δ18O measurements and 127 115 δ13C measurements from 371 individual speleothem records, and 10 composites from 174 cave systems. The distribution of sites is global in extent. The temporal distribution is excellent for the past 2000 years and good for the past 22 000 years. There are also records that span the last interglacial period. The format of the database is designed to facilitate the use of the data for regional- to continental-scale analyses, and in particular to facilitate comparisons with and evaluation of isotope-enabled climate model simulations. The SISAL working group will continue to expand the coverage of the SISAL database and will provide new chronologies based on standardized age models; subsequent versions of the database will be made freely available to the community. The supplement related to this article is available online at: https://doi.org/10.5194/essd-10-1687-2018-supplement. The following authors are members of the SISAL Working Group and contributed to the database: Tim Atkinson (Departments of Earth Sciences & Geography, University College London, WC1E 6BT, UK), Avner Ayalon (Geological Survey of Israel, 30 Malkei Israel St., Jerusalem, Israel), James Baldini (Department of Earth Sciences, Durham University, DH1 3LE, UK), Miriam Bar-Matthews (Geological Survey of Israel, 30 Malkei Israel St., Jerusalem, Israel), Juan Pablo Bernal (Centro de Geociencias, Universidad Nacional Autónoma de México, Campus UNAM Juriquilla, Querétaro 76230, Querétaro, Mexico), Sebastian Breitenbach (Institute of Geology, Mineralogy & Geophysics, Ruhr-Universität Bochum, Universitätsstr. 150, NABF04/751, 44801 Bochum, Germany), Ronny Boch (Graz University of Technology, Institute of Applied Geosciences, Rechbauerstrasse 12, 8010 Graz, Austria), Andrea Borsato (School of Environmental and Life Science, University of Newcastle, 2308 NSW, Australia), Yanjun Cai (State Key Lab of Loess and Quaternary Geology, Institute of Earth Environment, Chinese Academy of Sciences, Xi'an 710061, China), Stacy Carolin (Institute of Geology, University of Innsbruck, Innrain 52, 6020 Innsbruck, Austria), Hai Cheng (Institute of Global Environmental Change, Xi'an Jiaotong University, China), Andrea Columbu (Department of Biological, Geological and Environmental Sciences, Via Zamboni 67, 40126, Bologna, Italy), Isabelle Couchoud (EDYTEM, UMR 5204 CNRS, Université Savoie Mont Blanc, Université Grenoble Alpes, 73370 Le Bourget du Lac, France), Francisco Cruz (Instituto de Geociências, Universidade de São Paulo, São Paulo, Brazil), Attila Demény (Institute for Geological and Geochemical Research, Research Centre for Astronomy and Earth Sciences, Hungarian Academy of Sciences, Budaörsi út 45, 1112 Budapest, Hungary), David Dominguez-Villar (School of Geography, Earth and Environmental Sciences, University of Birmingham, Edgbaston B15 2TT Birmingham, UK), Virgil Drăgusin (Emil Racovitǎ Institute of Speleology, Romanian Academy, Frumoasǎ St. 31, Bucharest, Romania), Russell Drysdale (School of Geography, University of Melbourne, 3010 Victoria, Australia), Vasile Ersek (Department of Geography and Environmental Sciences, Northumbria University, Newcastle upon Tyne, UK), Martin Finné (Department of Archaeology and Ancient History, Uppsala University, Sweden), Dominik Fleitmann (Department of Archaeology, School of Archaeology, Geography and Environmental Science, Whiteknights, University of Reading, RG6 6AB, UK), Jens Fohlmeister (Institute for Earth and Environmental Sciences, University of Potsdam, Karl-Liebknecht-Str. 24–25, 14476 Potsdam, Germany), Amy Frappier (Department of Geosciences, Skidmore College, Saratoga Springs, NY 12866, USA), Dominique Genty (Laboratoire des Science du Climat et de l'Environment, CNRS, L'Orme des Merisiers, 91191 Gif-sure-Yvette CEDEX, France), Steffen Holzkämper (Department of Physical Geography, Stockholm University, 106 91 Stockholm, Sweden), Philip Hopley (Department of Earth and Planetary Sciences, Birkbeck, University of London, Malet St, London, WC1E 7HX, UK), Gayatri Kathayat (Institute of Global Environmental Change, Xi'an Jiaotong University, China), Duncan Keenan-Jones (School of Historical and Philosophical Inquiry, The University of Queensland, St Lucia QLD 4072, Australia), Gabriella Koltai (Institute of Geology, University of Innsbruck, Innrain 52, 6020 Innsbruck, Austria), Marc Luetscher (Swiss Institute for Speleology and Karst Studies (SISKA), Serre 68, 2300 La Chaux-de-Fonds, Switzerland), Ting-Yong Li (1: Swiss Institute for Speleology and Karst Studies (SISKA), Serre 68, 2300 La Chaux-de-Fonds, Switzerland; 2: Field Scientific Observation & Research Base of Karst Eco-environments at Nanchuan in Chongqing, Ministry of Land and Resources of China, Chongqing, 408435, China), Mahjoor Ahmad Lone (1: High-Precision Mass Spectrometry and Environment Change Laboratory (HISPEC), Department of Geosciences, National Taiwan University, Taipei 10617, Taiwan, China; 2: Research Center for Future Earth, National Taiwan University, Taipei 10617, Taiwan, China), Monika Markowska (University of Tübingen, Hölderlinstr. 12, 72074 Tübingen, Germany), Dave Mattey (Department of Earth Sciences, Royal Holloway University of London, Egham, Surrey, TW20 0EX, UK), Frank McDermott (UCD School of Earth Sciences, University College Dublin, Belfield, Dublin 4, Ireland), Ana Moreno (Dpto. de Procesos Geoambientales y Cambio Global, Instituto Pirenaico de Ecología-CSIC, Zaragoza, Spain), Gina Moseley (Institute of Geology, University of Innsbruck, Innrain 52, 6020 Innsbruck, Austria), Carole Nehme (IDEES UMR 6266 CNRS, Geography department, University of Rouen Normandie, Mont Saint Aignan, France), Valdir F. Novello (Instituto de Geociências, Universidade de São Paulo, São Paulo, Brazil), David Psomiadis (Imprint Analytics GmbH, Werner von Siemens Str. 1, 7343 Neutal, Austria), Kira Rehfeld (1: British Antarctic Survey, High Cross, Madingley Road, CB3 0ET, Cambridge, UK; 2: Institute of Environmental Physics, Ruprecht-Karls-Universität Heidelberg, Im Neuenheimer Feld 229, 69120 Heidelberg, Germany), Jiaoyang Ruan (Guangdong Provincial Key Lab of Geodynamics and Geohazards, School of Earth Sciences and Engineering, Sun Yat-sen University, Guangzhou 510275, China), Natasha Sekhon (Department of Geological Sciences, Jackson School of Geosciences, University of Texas at Austin, Austin, TX, USA), Lijuan Sha (Institute of Global Environmental Change, Xi'an Jiaotong University, Xi'an, Shaanxi, China), Denis Sholz (Institute for Geosciences, University of Mainz, Johann-Joachim-Becher-Weg 21, 55128 Mainz, Germany), Yavor Shopov (University Center for Space Research and Technologies, Faculty of Physics, University of Sofia, James Baucher 5, Sofia 1164, Bulgaria), Andrew Smith (NERC Isotope Geoscience Facility, British Geological Survey, Nottingham, UK), Nicolás Strikis (Departamento de Geoquímica, Universidade Federal Fluminense, Niterói, Brazil), Pauline Treble (ANSTO, Lucas Heights NSW, Australia), Ezgi Ünal-İmer (Department of Geological Engineering, Hacettepe University, Turkey), Anton Vaks (Geological Survey of Israel, 30 Malkhei Israel St., Jerusalem, Israel), Stef Vansteenberge (Analytical, Environmental & Geo-Chemistry, Department of Chemistry, Vrije Universiteit Brussel, Brussels, Belgium), Cristina Veiga-Pires (University of Algarve – FCT, CIMA Research Center, Campus de Gambelas, 8005139 Faro, Portugal), Ny Riavo Voarintsoa (Institute of Earth Sciences, The Hebrew University, Jerusalem, Israel), Xianfeng Wang (Earth Observatory of Singapore, Nanyang Technological University, Singapore 636798), Corinne Wong (Environmental Science Institute, The University of Texas at Austin, 2275 Speedway, Austin, TX 78712, USA), Barbara Wortham (Department of Earth and Planetary Science, University of California, Davis, California, USA), Jennifer Wurtzel (1: Research School of Earth Sciences, Australian National University, Canberra, ACT, Australia; 2: ARC Centre of Excellence for Climate System Science, Australian National University, Canberra, ACT, Australia; 3: now at: NSW Department of Primary Industries, Orange Agricultural Institute, Orange, NSW, Australia) and Baoyun Zong (Institute of Global Environmental Change, Xi'an Jiaotong University, Xi'an, Shaanxi, China). LCB is the coordinator of the SISAL working group. KA, SPH, LCB, MD and AB designed the database, drawing on discussions with participants at the first SISAL workshop. KA, SPH, LCB and SAM were responsible for the database construction. NK, SMA, MA, YAB, PB, KB, YB, SC, WD, IGH, JH, ZK, IL, ML, FL, AL, CP-M, RP and NS coordinated the regional data collection. All authors listed as “SISAL Working Group members” provided data or helped to complete data entry. TA and DG contributed original unpublished data to the database. The first draft of the paper was written by KA, SPH, LCB, MB, AB and NK and all authors contributed to the final version. SISAL (Speleothem Isotopes Synthesis and Analysis) is a working group of the Past Global Changes (PAGES) programme. We thank PAGES for their support for this activity. Additional financial support for SISAL activities has been provided by the European Geosciences Union (EGU TE Winter call, grant number W2017/413), Irish Centre for Research in Applied Geosciences (iCRAG), European Association of Geochemistry (Early Career Ambassadors program 2017), Geological Survey Ireland, Quaternary Research Association UK, Navarino Environmental Observatory, Stockholm University, Savillex, John Cantle, University of Reading and University College Dublin (Seed Funding award, grant number SF1428). The design and creation of the database has been supported by funding to Sandy P. Harrison from the ERC-funded project GC2.0 (Global Change 2.0: Unlocking the past for a clearer future, grant number 694481) and by funding to Laia Comas-Bru from the Geological Survey Ireland Short Call 2017 (Developing a toolkit for model evaluation using speleothem isotope data, grant number 2017-SC-056). Sandy P. Harrison also acknowledges funding from the JPI-Belmont project “PAlaeo-Constraints on Monsoon Evolution and Dynamics (PACMEDY)” through the UK Natural Environmental Research Council (NERC). We thank SISAL members who contributed their published data to the database and provided additional information when necessary. Affek, H. P., Matthews, A., Ayalon, A., Bar-Matthews, M., Burstyn, Y., Zaarur, S., and Zilberman, T.: Accounting for kinetic isotope effects in Soreq Cave (Israel) speleothems, Geochim. Cosmochim. Acta, 143, 303–318, https://doi.org/10.1016/j.gca.2014.08.008, 2014. Aharon, P., Aldridge, D., and Hellstrom, J.: Rainfall Variability and the Rise and Collapse of the Mississippian Chiefdoms: Evidence From a Desoto Caverns Stalagmite, in: Climates, Landscapes, and Civilizations, American Geophysical Union, 35–42, 2013. Ait Brahim, Y., Cheng, H., Sifeddine, A., Wassenburg, J. A., Cruz, F. W., Khodri, M., Sha, L., Pérez-Zanón, N., Beraaouz, E. H., Apaéstegui, J., Guyot, J.-L., Jochum, K. P., and Bouchaou, L.: Speleothem records decadal to multidecadal hydroclimate variations in southwestern Morocco during the last millennium, Earth Planet. Sci. Lett., 476, 1–10, https://doi.org/10.1016/j.epsl.2017.07.045, 2017. Akers, P. D., Brook, G. A., Railsback, L. B., Liang, F., Iannone, G., Webster, J. W., Reeder, P. P., Cheng, H., and Edwards, R. L.: An extended and higher-resolution record of climate and land use from stalagmite MC01 from Macal Chasm, Belize, revealing connections between major dry events, overall climate variability, and Maya sociopolitical changes, Palaeogeogr. Palaeocl., 459, 268–288, https://doi.org/10.1016/j.palaeo.2016.07.007, 2016. Apaéstegui, J., Cruz, F. W., Sifeddine, A., Vuille, M., Espinoza, J. C., Guyot, J. L., Khodri, M., Strikis, N., Santos, R. V., Cheng, H., Edwards, L., Carvalho, E., and Santini, W.: Hydroclimate variability of the northwestern Amazon Basin near the Andean foothills of Peru related to the South American Monsoon System during the last 1600 years, Clim. Past, 10, 1967–1981, https://doi.org/10.5194/cp-10-1967-2014, 2014. Arienzo, M. M., Swart, P. K., Pourmand, A., Broad, K., Clement, A. C., Murphy, L. N., Vonhof, H. B., and Kakuk, B.: Bahamian speleothem reveals temperature decrease associated with Heinrich stadials, Earth Planet. Sci. Lett., 430, 377–386, https://doi.org/10.1016/j.epsl.2015.08.035, 2015. Arienzo, M. M., Swart, P. K., Broad, K., Clement, A. C., Pourmand, A. and Kakuk, B.: Multi-proxy evidence of millennial climate variability from multiple Bahamian speleothems, Quaternary Sci. Rev., 161, 18–29, https://doi.org/10.1016/j.quascirev.2017.02.004, 2017. Asmerom, Y., Polyak, V. J., and Burns, S. J.: Variable winter moisture in the southwestern United States linked to rapid glacial climate shifts, Nat. Geosci., 3, 114–117, https://doi.org/10.1038/ngeo754, 2010. Asrat, A., Baker, A., Mohammed, M. U., Leng, M. J., Van Calsteren, P., and Smith, C.: A high-resolution multi-proxy stalagmite record from Mechara, Southeastern Ethiopia: palaeohydrological implications for speleothem palaeoclimate reconstruction, J. Quaternary Sci., 22, 53–63, https://doi.org/10.1002/jqs.1013, 2006. Asrat, A., Baker, A., Leng, M., Gunn, J., and Umer, M.: Environmental monitoring in the Mechara caves, Southeastern Ethiopia: implications for speleothem palaeoclimate studies, Int. J. Speleol., 37, 207–220, https://doi.org/10.5038/1827-806x.37.3.5, 2008. Atkinson, T. C. and Hopley, P. J.: Speleothems and Palaeoclimates, chap. 5, in: Caves and Karst of the Yorkshire Dales, esite by: Waltham, T. and Lowe, D., British Cave Research Association, Buxton, 181–186, 2013. Atsawawaranunt, K., Harrison, S. P., and Comas-Bru, L.: SISAL (Speleothem Isotopes Synthesis and AnaLysis Working Group) database Version 1.0, University of Reading, Dataset, https://doi.org/10.17864/1947.147, last access: 4 September 2018. Ayliffe, L. K., Marianelli, P. C., Moriarty, K. C., Wells, R. T., McCulloch, M. T., Mortimer, G. E., and Hellstrom, J. C.: 500 ka precipitation record from southeastern Australia: Evidence for interglacial relative aridity, Geology, 26, 147–150, https://doi.org/10.1130/0091-7613(1998)026<0147:KPRFSA>2.3.CO;2, 1998. Ayliffe, L. K., Gagan, M. K., Zhao, J., Drysdale, R. N., Hellstrom, J. C., Hantoro, W. S., Griffiths, M. L., Scott-Gagan, H., Pierre, E. S., Cowley, J. A., and Suwargadi, B. W.: Rapid interhemispheric climate links via the Australasian monsoon during the last deglaciation, Nat. Commun., 4, 2908, https://doi.org/10.1038/ncomms3908, 2013. Bajo, P., Hellstrom, J., Frisia, S., Drysdale, R., Black, J., Woodhead, J., Borsato, A., Zanchetta, G., Wallace, M. W., Regattieri, E., and Haese, R.: “Cryptic” diagenesis and its implications for speleothem geochronologies, Quaternary Sci. Rev., 148, 17–28, https://doi.org/10.1016/j.quascirev.2016.06.020, 2016. Baker, A., Ito, E., Smart, P. L., and McEwan, R. F.: Elevated and variable values of 13C in speleothems in a British cave system, Chem. Geol., 136, 263–270, https://doi.org/10.1016/S0009-2541(96)00129-5, 1997. Baker, A., Asrat, A., Fairchild, I. J., Leng, M. J., Wynn, P. M., Bryant, C., Genty, D., and Umer, M.: Analysis of the climate signal contained within δ18O and growth rate parameters in two Ethiopian stalagmites, Geochim. Cosmochim. Acta, 71, 2975–2988, https://doi.org/10.1016/j.gca.2007.03.029, 2007. Baker, A., Asrat, A., Fairchild, I. J., Leng, M. J., Thomas, L., Widmann, M., Jex, C. N., Dong, B., van Calsteren, P., and Bryant, C.: Decadal-scale rainfall variability in Ethiopia recorded in an annually laminated, Holocene-age, stalagmite, The Holocene, 20, 827–836, https://doi.org/10.1177/0959683610365934, 2010. Baker, A., Wilson, R., Fairchild, I. J., Franke, J., Spötl, C., Mattey, D., Trouet, V., and Fuller, L.: High resolution δ18O and δ13C records from an annually laminated Scottish stalagmite and relationship with last millennium climate, Global Planet. Change, 79, 303–311, https://doi.org/10.1016/j.gloplacha.2010.12.007, 2011. Baker, A., Bradley, C., Phipps, S. J., Fischer, M., Fairchild, I. J., Fuller, L., Spötl, C., and Azcurra, C.: Millennial-length forward models and pseudoproxies of stalagmite δ18O: an example from NW Scotland, Clim. Past, 8, 1153–1167, https://doi.org/10.5194/cp-8-1153-2012, 2012. Baker, J. L., Lachniet, M. S., Chervyatsova, O., Asmerom, Y., and Polyak, V. J.: Holocene warming in western continental Eurasia driven by glacial retreat and greenhouse forcing, Nat. Geosci., 10, 430–435, https://doi.org/10.1038/ngeo2953, 2017. Baldini, J., McDermott, F., Baker, A., Baldini, L., Mattey, D., and Railsback, L.: Biomass effects on stalagmite growth and isotope ratios: A 20th century analogue from Wiltshire, England, Earth Planet. Sci. Lett., 240, 486–494, https://doi.org/10.1016/j.epsl.2005.09.022, 2005. Baldini, J. U. L.: Morphologic and dimensional linkage between recently deposited speleothems and drip water from Browns Folly Mine, Wiltshire, England, J. Cave Karst Stud., 63, 83–90, available at: https://caves.org/pub/journal/PDF/V63/cave_63-03-fullr.pdf (last access: 30 May 2018), 2001. Baldini, J. U. L., McDermott, F., Hoffmann, D. L., Richards, D. A., and Clipson, N.: Very high-frequency and seasonal cave atmosphere PCO2 variability: Implications for stalagmite growth and oxygen isotope-based paleoclimate records, Earth Planet. Sci. Lett., 272, 118–129, https://doi.org/10.1016/j.epsl.2008.04.031, 2008. Bar-Matthews, M., Ayalon, A., Kaufman, A. and Wasserburg, G. J.: The Eastern Mediterranean paleoclimate as a reflection of regional events: Soreq cave, Israel, Earth Planet. Sci. Lett., 166, 85–95, https://doi.org/10.1016/S0012-821X(98)00275-1, 1999. Bartolomé, M., Moreno, A., Sancho, C., Stoll, H. M., Cacho, I., Spötl, C., Belmonte, Á., Edwards, R. L., Cheng, H., and Hellstrom, J. C.: Hydrological change in Southern Europe responding to increasing North Atlantic overturning during Greenland Stadial 1, P. Natl. Acad. Sci. USA, 112, 6568–6572, https://doi.org/10.1073/pnas.1503990112, 2015. Berkelhammer, M., Sinha, A., Mudelsee, M., Cheng, H., Edwards, R. L., and Cannariato, K.: Persistent multidecadal power of the Indian Summer Monsoon, Earth Planet. Sci. Lett., 290, 166–172, https://doi.org/10.1016/j.epsl.2009.12.017, 2010. Berkelhammer, M., Sinha, A., Stott, L., Cheng, H., Pausata, F. S. R., and Yoshimura, K.: An Abrupt Shift in the Indian Monsoon 4000 Years Ago, in: Climates, Landscapes, and Civilizations, American Geophysical Union, 75–88, 2013. Bernal, J. P., Lachniet, M., McCulloch, M., Mortimer, G., Morales, P., and Cienfuegos, E.: A speleothem record of Holocene climate variability from southwestern Mexico, Quaternary Res., 75, 104–113, https://doi.org/10.1016/j.yqres.2010.09.002, 2011. Bernal, J. P., Cruz, F. W., Stríkis, N. M., Wang, X., Deininger, M., Catunda, M. C. A., Ortega-Obregón, C., Cheng, H., Edwards, R. L., and Auler, A. S.: High-resolution Holocene South American monsoon history recorded by a speleothem from Botuverá Cave, Brazil, Earth Planet. Sci. Lett., 450, 186–196, https://doi.org/10.1016/j.epsl.2016.06.008, 2016. Boch, R. and Spötl, C.: Reconstructing palaeoprecipitation from an active cave flowstone, J. Quaternary Sci., 26, 675–687, https://doi.org/10.1002/jqs.1490, 2011. Boch, R., Spötl, C., and Kramers, J.: High-resolution isotope records of early Holocene rapid climate change from two coeval stalagmites of Katerloch Cave, Austria, Quaternary Sci. Rev., 28, 2527–2538, https://doi.org/10.1016/j.quascirev.2009.05.015, 2009. Bolliet, T., Brockmann, P., Masson-Delmotte, V., Bassinot, F., Daux, V., Genty, D., Landais, A., Lavrieux, M., Michel, E., Ortega, P., Risi, C., Roche, D. M., Vimeux, F., and Waelbroeck, C.: Water and carbon stable isotope records from natural archives: a new database and interactive online platform for data browsing, visualizing and downloading, Clim. Past, 12, 1693–1719, https://doi.org/10.5194/cp-12-1693-2016, 2016. Bowen, G. J. and Wilkinson, B.: Spatial distribution of δ18O in meteoric precipitation, Geology, 30, 315–318, https://doi.org/10.1130/0091-7613(2002)030<0315:SDOOIM>2.0.CO;2, 2002. Bradley, R. S.: Paleoclimatology: Reconstructing Climates of the Quaternary, 3rd edn., Academic Press, https://doi.org/10.1016/C2009-0-18310-1, 2015. Breitenbach, S. F. M., Lechleitner, F. A., Meyer, H., Diengdoh, G., Mattey, D., and Marwan, N.: Cave ventilation and rainfall signals in dripwater in a monsoonal setting – a monitoring study from NE India, Chem. Geol., 402, 111–124, https://doi.org/10.1016/j.chemgeo.2015.03.011, 2015. Bronk Ramsey, C.: Radiocarbon Calibration and Analysis of Stratigraphy: The OxCal Program, Radiocarbon, 37, 425–430, https://doi.org/10.1017/S0033822200030903, 1995. Bronk Ramsey, C.: Development of the Radiocarbon Calibration Program, Radiocarbon, 43, 355–363, https://doi.org/10.1017/S0033822200038212, 2001. Burns, S. J.: A 780-year annually resolved record of Indian Ocean monsoon precipitation from a speleothem from south Oman, J. Geophys. Res., 107, 4434, https://doi.org/10.1029/2001jd001281, 2002. Burns, S. J., Godfrey, L. R., Faina, P., McGee, D., Hardt, B., Ranivoharimanana, L., and Randrianasy, J.: Rapid human-induced landscape transformation in Madagascar at the end of the first millennium of the Common Era, Quaternary Sci. Rev., 134, 92–99, https://doi.org/10.1016/j.quascirev.2016.01.007, 2016. Cai, Y., Cheng, H., An, Z., Edwards, R. L., Wang, X., Tan, L., and Wang, J.: Large variations of oxygen isotopes in precipitation over south-central Tibet during Marine Isotope Stage 5, Geology, 38, 243–246, https://doi.org/10.1130/g30306.1, 2010a. Cai, Y., Tan, L., Cheng, H., An, Z., Edwards, R. L., Kelly, M. J., Kong, X., and Wang, X.: The variation of summer monsoon precipitation in central China since the last deglaciation, Earth Planet. Sci. Lett., 291, 21–31, https://doi.org/10.1016/j.epsl.2009.12.039, 2010b. Cai, Y., Zhang, H., Cheng, H., An, Z., Lawrence Edwards, R., Wang, X., Tan, L., Liang, F., Wang, J., Kelly, M., Edwards, R. L., Wang, X., Tan, L., Liang, F., Wang, J., and Kelly, M.: The Holocene Indian monsoon variability over the southern Tibetan Plateau and its teleconnections, Earth Planet. Sci. Lett., 335–336, 135–144, https://doi.org/10.1016/j.epsl.2012.04.035, 2012. Cai, Y., Fung, I. Y., Edwards, R. L., An, Z., Cheng, H., Lee, J.-E., Tan, L., Shen, C.-C., Wang, X., Day, J. A., Zhou, W., Kelly, M. J., and Chiang, J. C. H.: Variability of stalagmite-inferred Indian monsoon precipitation over the past 252,000 y, P. Natl. Acad. Sci. USA, 112, 2954–2959, https://doi.org/10.1073/pnas.1424035112, 2015. Caley, T., Roche, D. M., Waelbroeck, C., and Michel, E.: Oxygen stable isotopes during the Last Glacial Maximum climate: perspectives from data–model (iLOVECLIM) comparison, Clim. Past, 10, 1939–1955, https://doi.org/10.5194/cp-10-1939-2014, 2014. Carolin, S. A., Cobb, K. M., Adkins, J. F., Clark, B., Conroy, J. L., Lejau, S., Malang, J., and Tuen, A. A.: Varied Response of Western Pacific Hydrology to Climate Forcings over the Last Glacial Period, Science, 340, 1564–1566, https://doi.org/10.1126/science.1233797, 2013. Carolin, S. A., Cobb, K. M., Lynch-Stieglitz, J., Moerman, J. W., Partin, J. W., Lejau, S., Malang, J., Clark, B., Tuen, A. A., and Adkins, J. F.: Northern Borneo stalagmite records reveal West Pacific hydroclimate across MIS 5 and 6, Earth Planet. Sci. Lett., 439, 182–193, https://doi.org/10.1016/j.epsl.2016.01.028, 2016. Chen, S., Hoffmann, S. S., Lund, D. C., Cobb, K. M., Emile-Geay, J., and Adkins, J. F.: A high-resolution speleothem record of western equatorial Pacific rainfall: Implications for Holocene ENSO evolution, Earth Planet. Sci. Lett., 442, 61–71, https://doi.org/10.1016/j.epsl.2016.02.050, 2016. Cheng, H., Edwards, R., Hoff, J., Gallup, C., Richards, D., and Asmerom, Y.: The half-lives of uranium-234 and thorium-230, Chem. Geol., 169, 17–33, https://doi.org/10.1016/S0009-2541(99)00157-6, 2000. Cheng, H., Zhang, P. Z., Spötl, C., Edwards, R. L., Cai, Y. J., Zhang, D. Z., Sang, W. C., Tan, M., and An, Z. S.: The climatic cyclicity in semiarid-arid central Asia over the past 500,000 years, Geophys. Res. Lett., 39, L01705, https://doi.org/10.1029/2011GL050202, 2012. Cheng, H., Lawrence Edwards, R., Shen, C.-C., Polyak, V. J., Asmerom, Y., Woodhead, J., Hellstrom, J., Wang, Y., Kong, X., Spötl, C., Wang, X., and Calvin Alexander, E.: Improvements in 230Th dating, 230Th and 234U half-life values, and U–Th isotopic measurements by multi-collector inductively coupled plasma mass spectrometry, Earth Planet. Sci. Lett., 371–372, 82–91, https://doi.org/10.1016/j.epsl.2013.04.006, 2013. Cheng, H., Spötl, C., Breitenbach, S. F. M., Sinha, A., Wassenburg, J. A., Jochum, K. P., Scholz, D., Li, X., Yi, L., Peng, Y., Lv, Y., Zhang, P., Votintseva, A., Loginov, V., Ning, Y., Kathayat, G., and Edwards, R. L.: Climate variations of Central Asia on orbital to millennial timescales, Sci. Rep., 6, 36975, https://doi.org/10.1038/srep36975, 2016a. Cheng, H., Edwards, R. L., Sinha, A., Spötl, C., Yi, L., Chen, S., Kelly, M., Kathayat, G., Wang, X., Li, X., Kong, X., Wang, Y., Ning, Y., and Zhang, H.: The Asian monsoon over the past 640,000 years and ice age terminations, Nature, 534, 640–646, https://doi.org/10.1038/nature18591, 2016b. Cobb, K. M., Adkins, J. F., Partin, J. W., and Clark, B.: Regional-scale climate influences on temporal variations of rainwater and cave dripwater oxygen isotopes in northern Borneo, Earth Planet. Sci. Lett., 263, 207–220, https://doi.org/10.1016/j.epsl.2007.08.024, 2007. Cohen, K. M., Finney, S., and Gibbard, P. L.: International Chronostratigraphic Chart, Int. Comm. Stratigr., available at: http://www.stratigraphy.org (last access: 30 May 2018), 2015. Columbu, A., Drysdale, R., Capron, E., Woodhead, J., Waele, J. De, Sanna, L., Hellstrom, J., and Bajo, P.: Early last glacial intra-interstadial climate variability recorded in a Sardinian speleothem, Quaternary Sci. Rev., 169, 391–397, https://doi.org/10.1016/j.quascirev.2017.05.007, 2017. Couchoud, I., Genty, D., Hoffmann, D., Drysdale, R., and Blamart, D.: Millennial-scale climate variability during the Last Interglacial recorded in a speleothem from south-western France, Quaternary Sci. Rev., 28, 3263–3274, https://doi.org/10.1016/j.quascirev.2009.08.014, 2009. Cruz, F. W., Burns, S. J., Karmann, I., Sharp, W. D., Vuille, M., Cardoso, A. O., Ferrari, J. A., Dias, P. L. S., and Viana, O.: Insolation-driven changes in atmospheric circulation over the past 116,000 years in subtropical Brazil, Nature, 434, 63–66, https://doi.org/10.1038/nature03365, 2005. Cruz, F. W., Vuille, M., Burns, S. J., Wang, X., Cheng, H., Werner, M., Lawrence Edwards, R., Karmann, I., Auler, A. S., and Nguyen, H.: Orbitally driven east–west antiphasing of South American precipitation, Nat. Geosci., 2, 210–214, https://doi.org/10.1038/ngeo444, 2009. Daley, T. J., Thomas, E. R., Holmes, J. A., Street-Perrott, F. A., Chapman, M. R., Tindall, J. C., Valdes, P. J., Loader, N. J., Marshall, J. D., Wolff, E. W., Hopley, P. J., Atkinson, T., Barber, K. E., Fisher, E. H., Robertson, I., Hughes, P. D. M., and Roberts, C. N.: The 8200 yr BP cold event in stable isotope records from the North Atlantic region, Global Planet. Change, 79, 288–302, https://doi.org/10.1016/j.gloplacha.2011.03.006, 2011. Demény, A., Czuppon, G., Siklósy, Z., Leél-Őssy, S., Lin, K., Shen, C.-C., and Gulyás, K.: Mid-Holocene climate conditions and moisture source variations based on stable H, C and O isotope compositions of speleothems in Hungary, Quatern. Int., 293, 150–156, https://doi.org/10.1016/j.quaint.2012.05.035, 2013. Demény, A., Kern, Z., Czuppon, G., Németh, A., Schöll-Barna, G., Siklósy, Z., Leél-Őssy, S., Cook, G., Serlegi, G., Bajnóczi, B., Sümegi, P., Király, Á., Kiss, V., Kulcsár, G., and Bondár, M.: Middle Bronze Age humidity and temperature variations, and societal changes in East-Central Europe, Quatern. Int., https://doi.org/10.1016/j.quaint.2017.11.023, online first, 2017a. Demény, A., Kern, Z., Czuppon, G., Németh, A., Leél-Őssy, S., Siklósy, Z., Lin, K., Hu, H.-M., Shen, C.-C., Vennemann, T. W., and Haszpra, L.: Stable isotope compositions of speleothems from the last interglacial – Spatial patterns of climate fluctuations in Europe, Quaternary Sci. Rev., 161, 68–80, https://doi.org/10.1016/j.quascirev.2017.02.012, 2017b. Denniston, R. F., Wyrwoll, K.-H., Polyak, V. J., Brown, J. R., Asmerom, Y., Wanamaker, A. D., LaPointe, Z., Ellerbroek, R., Barthelmes, M., Cleary, D., Cugley, J., Woods, D., and Humphreys, W. F.: A Stalagmite record of Holocene Indonesian–Australian summer monsoon variability from the Australian tropics, Quaternary Sci. Rev., 78, 155–168, https://doi.org/10.1016/j.quascirev.2013.08.004, 2013a. Denniston, R. F., Wyrwoll, K.-H., Asmerom, Y., Polyak, V. J., Humphreys, W. F., Cugley, J., Woods, D., LaPointe, Z., Peota, J., and Greaves, E.: North Atlantic forcing of millennial-scale Indo-Australian monsoon dynamics during the Last Glacial period, Quaternary Sci. Rev., 72, 159–168, https://doi.org/10.1016/j.quascirev.2013.04.012, 2013b. Denniston, R. F., Villarini, G., Gonzales, A. N., Wyrwoll, K.-H., Polyak, V. J., Ummenhofer, C. C., Lachniet, M. S., Wanamaker, A. D., Humphreys, W. F., Woods, D., and Cugley, J.: Extreme rainfall activity in the Australian tropics reflects changes in the El Niño/Southern Oscillation over the last two millennia, P. Natl. Acad. Sci. USA, 112, 4576–4581, https://doi.org/10.1073/pnas.1422270112, 2015. Denniston, R. F., Ummenhofer, C. C., Wanamaker, A. D., Lachniet, M. S., Villarini, G., Asmerom, Y., Polyak, V. J., Passaro, K. J., Cugley, J., Woods, D., and Humphreys, W. F.: Expansion and Contraction of the Indo-Pacific Tropical Rain Belt over the Last Three Millennia, Sci. Rep., 6, 34485, https://doi.org/10.1038/srep34485, 2016. Dong, J., Wang, Y., Cheng, H., Hardt, B., Edwards, R. L., Kong, X., Wu, J., Chen, S., Liu, D., Jiang, X., and Zhao, K.: A high-resolution stalagmite record of the Holocene East Asian monsoon from Mt Shennongjia, central China, The Holocene, 20, 257–264, https://doi.org/10.1177/0959683609350393, 2010. Dorale, J. A., Edwards, R. L., Ito, E., and González, L. A.: Climate and vegetation history of the midcontinent from 75 to 25 ka: a speleothem record from Crevice Cave, Missouri, USA, Science, 282, 1871–1874, https://doi.org/10.1126/science.282.5395.1871, 1998. Drǎguşin, V., Staubwasser, M., Hoffmann, D. L., Ersek, V., Onac, B. P., and Veres, D.: Constraining Holocene hydrological changes in the Carpathian–Balkan region using speleothem δ18O and pollen-based temperature reconstructions, Clim. Past, 10, 1363–1380, https://doi.org/10.5194/cp-10-1363-2014, 2014. Drysdale, R. N., Zanchetta, G., Hellstrom, J. C., Fallick, A. E., Zhao, J., Isola, I., and Bruschi, G.: Palaeoclimatic implications of the growth history and stable isotope (δ18O and δ13C) geochemistry of a Middle to Late Pleistocene stalagmite from central-western Italy, Earth Planet. Sci. Lett., 227, 215–229, https://doi.org/10.1016/j.epsl.2004.09.010, 2004. Drysdale, R. N., Zanchetta, G., Hellstrom, J. C., Fallick, A. E., and Zhao, J.: Stalagmite evidence for the onset of the Last Interglacial in southern Europe at 129±1 ka, Geophys. Res. Lett., 32, L24708, https://doi.org/10.1029/2005GL024658, 2005. Drysdale, R. N., Zanchetta, G., Hellstrom, J. C., Fallick, A. E., McDonald, J., and Cartwright, I.: Stalagmite evidence for the precise timing of North Atlantic cold events during the early last glacial, Geology, 35, 77–80, https://doi.org/10.1130/G23161A.1, 2007. Drysdale, R. N., Hellstrom, J. C., Zanchetta, G., Fallick, A. E., Sanchez Goni, M. F., Couchoud, I., McDonald, J., Maas, R., Lohmann, G., and Isola, I.: Evidence for Obliquity Forcing of Glacial Termination II, Science, 325, 1527–1531, https://doi.org/10.1126/science.1170371, 2009. Duan, W., Cheng, H., Tan, M., and Edwards, R. L.: Onset and duration of transitions into Greenland Interstadials 15.2 and 14 in northern China constrained by an annually laminated stalagmite, Sci. Rep., 6, 20844, https://doi.org/10.1038/srep20844, 2016. Dutt, S., Gupta, A. K., Clemens, S. C., Cheng, H., Singh, R. K., Kathayat, G., and Edwards, R. L.: Abrupt changes in Indian summer monsoon strength during 33,800 to 5500 years B.P., Geophys. Res. Lett., 42, 5526–5532, https://doi.org/10.1002/2015GL064015, 2015. Edwards, R. L., Chen, J. H., and Wasserburg, G. J.: 238U–234U–230Th–232Th systematics and the precise measurement of time over the past 500,000 years, Earth Planet. Sci. Lett., 81, 175–192, https://doi.org/10.1016/0012-821X(87)90154-3, 1987. Ersek, V., Clark, P. U., Mix, A. C., Cheng, H., and Edwards, R. L.: Holocene winter climate variability in mid-latitude western North America, Nat. Commun., 3, 1219, https://doi.org/10.1038/ncomms2222, 2012. Fairchild, I. J. and Baker, A.: Speleothem Science, John Wiley & Sons, Ltd, Chichester, UK, 2012. Feng, W., Hardt, B. F., Banner, J. L., Meyer, K. J., James, E. W., Musgrove, M., Edwards, R. L., Cheng, H., and Min, A.: Changing amounts and sources of moisture in the U.S. southwest since the Last Glacial Maximum in response to global climate change, Earth Planet. Sci. Lett., 401, 47–56, https://doi.org/10.1016/j.epsl.2014.05.046, 2014. Finné, M., Bar-Matthews, M., Holmgren, K., Sundqvist, H. S., Liakopoulos, I., and Zhang, Q.: Speleothem evidence for late Holocene climate variability and floods in Southern Greece, Quaternary Res., 81, 213–227, https://doi.org/10.1016/j.yqres.2013.12.009, 2014. Fleitmann, D., Burns, S. J., Neff, U., Mudelsee, M., Mangini, A., and Matter, A.: Palaeoclimatic interpretation of high-resolution oxygen isotope profiles derived from annually laminated speleothems from Southern Oman, Quaternary Sci. Rev., 23, 935–945, https://doi.org/10.1016/j.quascirev.2003.06.019, 2004. Fohlmeister, J., Vollweiler, N., Spötl, C., and Mangini, A.: COMNISPA II: Update of a mid-European isotope climate record, 11 ka to present, The Holocene, 23, 749–754, https://doi.org/10.1177/0959683612465446, 2013. Fohlmeister, J., Plessen, B., Dudashvili, A. S., Tjallingii, R., Wolff, C., Gafurov, A., and Cheng, H.: Winter precipitation changes during the Medieval Climate Anomaly and the Little Ice Age in arid Central Asia, Quaternary Sci. Rev., 178, 24–36, https://doi.org/10.1016/j.quascirev.2017.10.026, 2017. Frisia, S., Borsato, A., Mangini, A., Spötl, C., Madonia, G., and Sauro, U.: Holocene Climate Variability in Sicily from a Discontinuous Stalagmite Record and the Mesolithic to Neolithic Transition, Quaternary Res., 66, 388–400, https://doi.org/10.1016/j.yqres.2006.05.003, 2006. Frisia, S., Fairchild, I. J., Fohlmeister, J., Miorandi, R., Spotl, C., and Borsato, A.: Carbon mass-balance modelling and carbon isotope exchange processes in dynamic caves, Geochim. Cosmochim. Acta, 75, 380–400, https://doi.org/10.1016/j.gca.2010.10.021, 2011. Frumkin, A., Ford, D. C., and Schwarcz, H. P.: Continental Oxygen Isotopic Record of the Last 170,000 Years in Jerusalem, Quaternary Res., 51, 317–327, https://doi.org/10.1006/qres.1998.2031, 1999. Frumkin, A., Ford, D. C., and Schwarcz, H. P.: Paleoclimate and vegetation of the Last Glacial Cycles in Jerusalem from a Speleothem Record, Global Biogeochem. Cy., 14, 863–870, https://doi.org/10.1029/1999gb001245, 2000. Genty, D., Vokal, B., Obelic, B., and Massault, M.: Bomb 14C time history recorded in two modern stalagmites – importance for soil organic matter dynamics and bomb 14C distribution over continents, Earth Planet. Sci. Lett., 160, 795–809, https://doi.org/10.1016/S0012-821X(98)00128-9, 1998. Genty, D., Massault, M., Gilmour, M., Baker, A., Verheyden, S., and Kepens, E.: Calculation of Past Dead Carbon Proportion and Variability by the Comparison of AMS 14C and Tims U/TH Ages on Two Holocene Stalagmites, Radiocarbon, 41, 251–270, https://doi.org/10.1017/S003382220005712X, 1999. Genty, D., Blamart, D., Ouahdi, R., Gilmour, M., Baker, A., Jouzel, J., and Van-Exter, S.: Precise dating of Dansgaard–Oeschger climate oscillations in western Europe from stalagmite data, Nature, 421, 833–837, https://doi.org/10.1038/nature01391, 2003. Genty, D., Blamart, D., Ghaleb, B., Plagnes, V., Causse, C., Bakalowicz, M., Zouari, K., Chkir, N., Hellstrom, J., and Wainer, K.: Timing and dynamics of the last deglaciation from European and North African δ13C stalagmite profiles—comparison with Chinese and South Hemisphere stalagmites, Quaternary Sci. Rev., 25, 2118–2142, https://doi.org/10.1016/j.quascirev.2006.01.030, 2006. Genty, D., Combourieu-Nebout, N., Peyron, O., Blamart, D., Wainer, K., Mansuri, F., Ghaleb, B., Isabello, L., Dormoy, I., and von Grafenstein, U.: Isotopic characterization of rapid climatic events during OIS3 and OIS4 in Villars Cave stalagmites (SW-France) and correlation with Atlantic and Mediterranean pollen records, Quaternary Sci. Rev., 29, 2799–2820, https://doi.org/10.1016/j.quascirev.2010.06.035, 2010. Grant, K. M., Rohling, E. J., Bar-Matthews, M., Ayalon, A., Medina-Elizalde, M., Ramsey, C. B., Satow, C., and Roberts, A. P.: Rapid coupling between ice volume and polar temperature over the past 150,000 years, Nature, 491, 744–747, https://doi.org/10.1038/nature11593, 2012. Griffiths, M. L., Drysdale, R. N., Gagan, M. K., Zhao, J.-X., Ayliffe, L. K., Hellstrom, J. C., Hantoro, W. S., Frisia, S., Feng, Y.-X., Cartwright, I., Pierre, E. St., Fischer, M. J., and Suwargadi, B. W.: Increasing Australian–Indonesian monsoon rainfall linked to early Holocene sea-level rise, Nat. Geosci., 2, 636–639, https://doi.org/10.1038/ngeo605, 2009. Griffiths, M. L., Drysdale, R. N., Gagan, M. K., Hellstrom, J. C., Couchoud, I., Ayliffe, L. K., Vonhof, H. B., and Hantoro, W. S.: Australasian monsoon response to Dansgaard–Oeschger event 21 and teleconnections to higher latitudes, Earth Planet. Sci. Lett., 369–370, 294–304, https://doi.org/10.1016/j.epsl.2013.03.030, 2013. Griffiths, M. L., Kimbrough, A. K., Gagan, M. K., Drysdale, R. N., Cole, J. E., Johnson, K. R., Zhao, J.-X., Cook, B. I., Hellstrom, J. C., and Hantoro, W. S.: Western Pacific hydroclimate linked to global climate variability over the past two millennia, Nat. Commun., 7, 11719, https://doi.org/10.1038/ncomms11719, 2016. 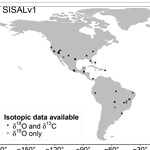 Haese, B., Werner, M., and Lohmann, G.: Stable water isotopes in the coupled atmosphere–land surface model ECHAM5-JSBACH, Geosci. Model Dev., 6, 1463–1480, https://doi.org/10.5194/gmd-6-1463-2013, 2013. Han, L.-Y., Li, T.-Y., Cheng, H., Edwards, R. L., Shen, C.-C., Li, H.-C., Huang, C.-X., Li, J.-Y., Yuan, N., Wang, H.-B., Zhang, T.-T., and Zhao, X.: Potential influence of temperature changes in the Southern Hemisphere on the evolution of the Asian summer monsoon during the last glacial period, Quatern. Int., 392, 239–250, https://doi.org/10.1016/j.quaint.2015.05.068, 2016. Hardt, B., Rowe, H. D., Springer, G. S., Cheng, H., and Edwards, R. L.: The seasonality of east central North American precipitation based on three coeval Holocene speleothems from southern West Virginia, Earth Planet. Sci. Lett., 295, 342–348, https://doi.org/10.1016/j.epsl.2010.04.002, 2010. Harrison, S. P., Bartlein, P. J., Brewer, S., Prentice, I. C., Boyd, M., Hessler, I., Holmgren, K., Izumi, K., and Willis, K.: Climate model benchmarking with glacial and mid-Holocene climates, Clim. Dynam., 43, 671–688, https://doi.org/10.1007/s00382-013-1922-6, 2014. Häuselmann, A. D., Fleitmann, D., Cheng, H., Tabersky, D., Günther, D., and Edwards, R. L.: Timing and nature of the penultimate deglaciation in a high alpine stalagmite from Switzerland, Quaternary Sci. Rev., 126, 264–275, https://doi.org/10.1016/j.quascirev.2015.08.026, 2015. Hellstrom, J., McCulloch, M., and Stone, J.: A Detailed 31,000-Year Record of Climate and Vegetation Change, from the Isotope Geochemistry of Two New Zealand Speleothems, Quaternary Res., 50, 167–178, https://doi.org/10.1006/qres.1998.1991, 1998. Hellstrom, J. C.: U–Th dating of speleothems with high initial 230Th using stratigraphical constraint, Quat. Geochronol., 1, 289–295, https://doi.org/10.1016/j.quageo.2007.01.004, 2006. Hendy, C.: The isotopic geochemistry of speleothems – I. The calculation of the effects of different modes of formaion on the isotopic composition of speleothems and their applicability as paleoclimatic indicators, Geochim. Cosmochim. Acta, 35, 801–824, https://doi.org/10.1016/0016-7037(71)90127-X, 1971. Holmgren, K., Lauritzen, S.-E., and Possnert, G.: 230Th234U and 14C dating of a late Pleistocene stalagmite in Lobatse II Cave, Botswana, Quaternary Sci. Rev., 13, 111–119, https://doi.org/10.1016/0277-3791(94)90036-1, 1994. Holmgren, K., Karlén, W., and Shaw, P. A.: Paleoclimatic Significance of the Stable Isotopic Composition and Petrology of a Late Pleistocene Stalagmite from Botswana, Quaternary Res., 43, 320–328, https://doi.org/10.1006/qres.1995.1038, 1995. Holmgren, K., Karlén, W., Lauritzen, S. E., Lee-Thorp, J. A., Partridge, T. C., Piketh, S., Repinski, P., Stevenson, C., Svanered, O., and Tyson, P. D.: A 3000-year high-resolution stalagmitebased record of palaeoclimate for northeastern South Africa, The Holocene, 9, 295–309, https://doi.org/10.1191/095968399672625464, 1999. Holmgren, K., Lee-Thorp, J. A., Cooper, G. R. J., Lundblad, K., Partridge, T. C., Scott, L., Sithaldeen, R., Talma, A. S., and Tyson, P. D.: Persistent millennial-scale climatic variability over the past 25,000 years in Southern Africa, Quaternary Sci. Rev., 22, 2311–2326, https://doi.org/10.1016/s0277-3791(03)00204-x, 2003. Holzkämper, S., Holmgren, K., Lee-Thorp, J., Talma, S., Mangini, A., and Partridge, T.: Late Pleistocene stalagmite growth in Wolkberg Cave, South Africa, Earth Planet. Sci. Lett., 282, 212–221, https://doi.org/10.1016/j.epsl.2009.03.016, 2009. Hopley, P. J., Weedon, G. P., Marshall, J. D., Herries, A. I. R., Latham, A. G., and Kuykendall, K. L.: High- and low-latitude orbital forcing of early hominin habitats in South Africa, Earth Planet. Sci. Lett., 256, 419–432, https://doi.org/10.1016/j.epsl.2007.01.031, 2007a. Hopley, P. J., Marshall, J. D., Weedon, G. P., Latham, A. G., Herries, A. I. R., and Kuykendall, K. L.: Orbital forcing and the spread of C4 grasses in the late Neogene: stable isotope evidence from South African speleothems, J. Hum. Evol., 53, 620–634, https://doi.org/10.1016/j.jhevol.2007.03.007, 2007b. Hu, C., Henderson, G. M., Huang, J., Xie, S., Sun, Y., and Johnson, K. R.: Quantification of Holocene Asian monsoon rainfall from spatially separated cave records, Earth Planet. Sci. Lett., 266, 221–232, https://doi.org/10.1016/j.epsl.2007.10.015, 2008. Huang, W., Wang, Y., Cheng, H., Edwards, R. L., Shen, C.-C., Liu, D., Shao, Q., Deng, C., Zhang, Z., and Wang, Q.: Multi-scale Holocene Asian monsoon variability deduced from a twin-stalagmite record in southwestern China, Quaternary Res., 86, 34–44, https://doi.org/10.1016/j.yqres.2016.05.001, 2016. Ivanovich, M. and Harmon, R.: Uranium-series disequilibrium: applications to earth, marine, and environmental sciences. 2, available at: https://inis.iaea.org/search/search.aspx?orig_q=RN:25065862 (last access: 30 January 2018), 1992. Jaqueto, P., Trindade, R. I. F., Hartmann, G. A., Novello, V. F., Cruz, F. W., Karmann, I., Strauss, B. E., and Feinberg, J. M.: Linking speleothem and soil magnetism in the Pau d'Alho cave (central South America), J. Geophys. Res.-Sol. Ea., 121, 7024–7039, https://doi.org/10.1002/2016JB013541, 2016. Johnston, V. E., Borsato, A., Spötl, C., Frisia, S., and Miorandi, R.: Stable isotopes in caves over altitudinal gradients: fractionation behaviour and inferences for speleothem sensitivity to climate change, Clim. Past, 9, 99–118, https://doi.org/10.5194/cp-9-99-2013, 2013. Joshi, L. M., Kotlia, B. S., Ahmad, S. M., Wu, C.-C., Sanwal, J., Raza, W., Singh, A. K., Shen, C.-C., Long, T., and Sharma, A. K.: Reconstruction of Indian monsoon precipitation variability between 4.0 and 1.6 ka BP using speleothem δ18O records from the Central Lesser Himalaya, India, Arab. J. Geosci., 10, 356, https://doi.org/10.1007/s12517-017-3141-7, 2017. Kacanski, A., Carmi, I., Shemesh, A., Kronfeld, J., Yam, R., and Flexer, A.: Late Holocene Climatic Change in the Balkans: Speleothem Isotopic Data from Serbia, Radiocarbon, 43, 647–658, https://doi.org/10.1017/s0033822200041308, 2001. Kathayat, G., Cheng, H., Sinha, A., Spötl, C., Edwards, R. L., Zhang, H., Li, X., Yi, L., Ning, Y., Cai, Y., Lui, W. L., and Breitenbach, S. F. M.: Indian monsoon variability on millennial-orbital timescales, Sci. Rep., 6, 24374, https://doi.org/10.1038/srep24374, 2016. Kennett, D. J., Breitenbach, S. F. M., Aquino, V. V, Asmerom, Y., Awe, J., Baldini, J. U. L., Bartlein, P., Culleton, B. J., Ebert, C., Jazwa, C., Macri, M. J., Marwan, N., Polyak, V., Prufer, K. M., Ridley, H. E., Sodemann, H., Winterhalder, B., and Haug, G. H.: Development and Disintegration of Maya Political Systems in Response to Climate Change, Science, 338, 788–791, https://doi.org/10.1126/science.1226299, 2012. Koltai, G., Spötl, C., Shen, C.-C., Wu, C.-C., Rao, Z., Palcsu, L., Kele, S., Surányi, G., and Bárány-Kevei, I.: A penultimate glacial climate record from southern Hungary, J. Quaternary Sci., 32, 946–956, https://doi.org/10.1002/jqs.2968, 2017. Kotlia, B. S., Singh, A. K., Sanwal, J., Raza, W., Ahmad, S. M., Joshi, L. M., Sirohi, M., Sharma, A. K., and Sagar, N.: Stalagmite Inferred High Resolution Climatic Changes through Pleistocene-Holocene Transition in Northwest Indian Himalaya, J. Earth Sci. Clim. Change, 7, https://doi.org/10.4172/2157-7617.1000338, 2016. Labuhn, I., Genty, D., Vonhof, H., Bourdin, C., Blamart, D., Douville, E., Ruan, J., Cheng, H., Edwards, R. L., Pons-Branchu, E., and Pierre, M.: A high-resolution fluid inclusion δ18O record from a stalagmite in SW France: modern calibration and comparison with multiple proxies, Quaternary Sci. Rev., 110, 152–165, https://doi.org/10.1016/j.quascirev.2014.12.021, 2015. Lachniet, M. S.: A 1500-year El Niño/Southern Oscillation and rainfall history for the Isthmus of Panama from speleothem calcite, J. Geophys. Res., 109, D20117, https://doi.org/10.1029/2004jd004694, 2004. Lachniet, M. S., Asmerom, Y., and Polyak, V.: Deglacial paleoclimate in the southwestern United States: an abrupt 18.6 ka cold event and evidence for a North Atlantic forcing of Termination I, Quaternary Sci. Rev., 30, 3803–3811, https://doi.org/10.1016/j.quascirev.2011.09.022, 2011. Lachniet, M. S., Bernal, J. P., Asmerom, Y., Polyak, V., and Piperno, D.: A 2400 yr Mesoamerican rainfall reconstruction links climate and cultural change, Geology, 40, 259–262, https://doi.org/10.1130/g32471.1, 2012. Lachniet, M. S., Asmerom, Y., Bernal, J. P., Polyak, V. J., and Vazquez-Selem, L.: Orbital pacing and ocean circulation-induced collapses of the Mesoamerican monsoon over the past 22,000 y, P. Natl. Acad. Sci. USA, 110, 9255–9260, https://doi.org/10.1073/pnas.1222804110, 2013. Lachniet, M. S., Denniston, R. F., Asmerom, Y., and Polyak, V. J.: Orbital control of western North America atmospheric circulation and climate over two glacial cycles, Nat. Commun., 5, 3805, https://doi.org/10.1038/ncomms4805, 2014. Lachniet, M. S., Asmerom, Y., Polyak, V., and Bernal, J. P.: Two millennia of Mesoamerican monsoon variability driven by Pacific and Atlantic synergistic forcing, Quaternary Sci. Rev., 155, 100–113, https://doi.org/10.1016/j.quascirev.2016.11.012, 2017. Lechleitner, F. A., Breitenbach, S. F. M., Cheng, H., Plessen, B., Rehfeld, K., Goswami, B., Marwan, N., Eroglu, D., Adkins, J., and Haug, G.: Climatic and in-cave influences on δ18O and δ13C in a stalagmite from northeastern India through the last deglaciation, Quaternary Res., 88, 458–471, https://doi.org/10.1017/qua.2017.72, 2017. Lee-Thorp, J. A., Holmgren, K., Lauritzen, S.-E., Linge, H., Moberg, A., Partridge, T. C., Stevenson, C., and Tyson, P. D.: Rapid climate shifts in the southern African interior throughout the Mid to Late Holocene, Geophys. Res. Lett., 28, 4507–4510, https://doi.org/10.1029/2000gl012728, 2001. Lewis, S. C., Gagan, M. K., Ayliffe, L. K., Zhao, J., Hantoro, W. S., Treble, P. C., Hellstrom, J. C., LeGrande, A. N., Kelley, M., Schmidt, G. A., and Suwargadi, B. W.: High-resolution stalagmite reconstructions of Australian–Indonesian monsoon rainfall variability during Heinrich stadial 3 and Greenland interstadial 4, Earth Planet. Sci. Lett., 303, 133–142, https://doi.org/10.1016/j.epsl.2010.12.048, 2011. Li, H.-C., Lee, Z.-H., Wan, N.-J., Shen, C.-C., Li, T.-Y., Yuan, D.-X., and Chen, Y.-H.: The δ18O and δ13C records in an aragonite stalagmite from Furong Cave, Chongqing, China: A-2000-year record of monsoonal climate, J. Asian Earth Sci., 40, 1121–1130, https://doi.org/10.1016/j.jseaes.2010.06.011, 2011. Li, J.-Y., Li, H.-C., Li, T.-Y., Mii, H.-S., Yu, T.-L., Shen, C.-C., and Xu, X.: High-resolution δ18O and δ13C records of an AMS 14C and 230Th/U dated stalagmite from Xinya Cave in Chongqing: Climate and vegetation change during the late Holocene, Quatern. Int., 447, 75–88, https://doi.org/10.1016/j.quaint.2017.06.075, 2017. Li, T., Yuan, D., Li, H., Yang, Y., Wang, J., Wang, X., Li, J., Qin, J., Zhang, M., and Lin, Y.: High-resolution climate variability of southwest China during 57–70 ka reflected in a stalagmite δ18O record from Xinya Cave, Sci. China Earth Sci., 50, 1202–1208, https://doi.org/10.1007/s11430-007-0059-z, 2007. Li, T.-Y., Shen, C.-C., Li, H.-C., Li, J.-Y., Chiang, H.-W., Song, S.-R., Yuan, D.-X., Lin, C. D.-J., Gao, P., Zhou, L., Wang, J.-L., Ye, M.-Y., Tang, L.-L., and Xie, S.-Y. : Oxygen and carbon isotopic systematics of aragonite speleothems and water in Furong Cave, Chongqing, China, Geochim. Cosmochim. Acta, 75, 4140–4156, https://doi.org/10.1016/j.gca.2011.04.003, 2011. Li, T.-Y., Shen, C.-C., Huang, L.-J., Jiang, X.-Y., Yang, X.-L., Mii, H.-S., Lee, S.-Y., and Lo, L.: Stalagmite-inferred variability of the Asian summer monsoon during the penultimate glacial–interglacial period, Clim. Past, 10, 1211–1219, https://doi.org/10.5194/cp-10-1211-2014, 2014. Linge, H., Lauritzen, S.-E., Lundberg, J., and Berstad, I. M.: Stable isotope stratigraphy of Holocene speleothems: examples from a cave system in Rana, northern Norway, Palaeogeogr. Palaeocl., 167, 209–224, https://doi.org/10.1016/s0031-0182(00)00225-x, 2001. Linge, H., Lauritzen, S.-E., Andersson, C., Hansen, J. K., Skoglund, R. Ø., and Sundqvist, H. S.: Stable isotope records for the last 10 000 years from Okshola cave (Fauske, northern Norway) and regional comparisons, Clim. Past, 5, 667–682, https://doi.org/10.5194/cp-5-667-2009, 2009a. Linge, H., Baker, A., Andersson, C., and Lauritzen, S.-E.: Variability in luminescent lamination and initial 230 Th/232 Th activity ratios in a late Holocene stalagmite from northern Norway, Quat. Geochronol., 4, 181–192, 2009b. Liu, Y.-H., Henderson, G. M., Hu, C.-Y., Mason, A. J., Charnley, N., Johnson, K. R., and Xie, S.-C.: Links between the East Asian monsoon and North Atlantic climate during the 8,200 year event, Nat. Geosci., 6, 117–120, https://doi.org/10.1038/ngeo1708, 2013. Lone, M. A., Ahmad, S. M., Dung, N. C., Shen, C.-C., Raza, W., and Kumar, A.: Speleothem based 1000-year high resolution record of Indian monsoon variability during the last deglaciation, Palaeogeogr. Palaeocl., 395, 1–8, https://doi.org/10.1016/j.palaeo.2013.12.010, 2014. Lorrey, A., Williams, P., Salinger, J., Martin, T., Palmer, J., Fowler, A., Zhao, J., and Neil, H.: Speleothem stable isotope records interpreted within a multi-proxy framework and implications for New Zealand palaeoclimate reconstruction, Quatern. Int., 187, 52–75, https://doi.org/10.1016/j.quaint.2007.09.039, 2008. Luetscher, M., Hoffmann, D. L., Frisia, S., and Spötl, C.: Holocene glacier history from alpine speleothems, Milchbach cave, Switzerland, Earth Planet. Sci. Lett., 302, 95–106, https://doi.org/10.1016/j.epsl.2010.11.042, 2011. Ma, Z.-B., Cheng, H., Tan, M., Edwards, R. L., Li, H.-C., You, C.-F., Duan, W.-H., Wang, X., and Kelly, M. J.: Timing and structure of the Younger Dryas event in northern China, Quaternary Sci. Rev., 41, 83–93, https://doi.org/10.1016/j.quascirev.2012.03.006, 2012. Madonia, G., Frisia, S., Borsato, A., Macaluso, T., Mangini, A., Paladini, M., Piccini, L., Miorandi, R., Spötl, C., Sauro, U., Agnesi, V., Di Pietro, R., Palmeri, A., and Vattano, M.: La Grotta di Carburangeli–ricostruzione climatica dell'Olocene per la piana costiera della Sicilia nord-occidentale, Stud. Trent Sci Nat Acta Geol, 80, 153–167 available at: http://www2.muse.it/pubblicazioni/6/actaG80/Vol_ACTA_80_2003_153-167.pdf (last access: 30 May 2018), 2005. Mattey, D., Lowry, D., Duffet, J., Fisher, R., Hodge, E., and Frisia, S.: A 53 year seasonally resolved oxygen and carbon isotope record from a modern Gibraltar speleothem: Reconstructed drip water and relationship to local precipitation, Earth Planet. Sci. Lett., 269, 80–95, https://doi.org/10.1016/j.epsl.2008.01.051, 2008. Mattey, D. P., Fairchild, I. J., Atkinson, T. C., Latin, J.-P., Ainsworth, M., and Durell, R.: Seasonal microclimate control of calcite fabrics, stable isotopes and trace elements in modern speleothem from St Michaels Cave, Gibraltar, Geol. Soc. London, Spec. Publ., 336, 323–344, https://doi.org/10.1144/sp336.17, 2010. McDermott, F.: Centennial-Scale Holocene Climate Variability Revealed by a High-Resolution Speleothem δ18O Record from SW Ireland, Science, 294, 1328–1331, https://doi.org/10.1126/science.1063678, 2001. McDermott, F.: Palaeo-climate reconstruction from stable isotope variations in speleothems: a review, Quaternary Sci. Rev., 23, 901–918, https://doi.org/10.1016/j.quascirev.2003.06.021, 2004. McDermott, F., Frisia, S., Huang, Y., Longinelli, A., Spiro, B., Heaton, T. H. E., Hawkesworth, C. J., Borsato, A., Keppens, E., Fairchild, I. J., van der Borg, K., Verheyden, S., and Selmo, E.: Holocene climate variability in Europe: Evidence from δ18O, textural and extension-rate variations in three speleothems, Quaternary Sci. Rev., 18, 1021–1038, https://doi.org/10.1016/S0277-3791(98)00107-3, 1999. Meckler, A. N., Clarkson, M. O., Cobb, K. M., Sodemann, H., and Adkins, J. F.: Interglacial Hydroclimate in the Tropical West Pacific Through the Late Pleistocene, Science, 336, 1301–1304, https://doi.org/10.1126/science.1218340, 2012. Medina-Elizalde, M., Burns, S. J., Lea, D. W., Asmerom, Y., von Gunten, L., Polyak, V., Vuille, M., and Karmalkar, A.: High resolution stalagmite climate record from the Yucatán Peninsula spanning the Maya terminal classic period, Earth Planet. Sci. Lett., 298, 255–262, https://doi.org/10.1016/j.epsl.2010.08.016, 2010. Meyer, M. C., Spötl, C., and Mangini, A.: The demise of the Last Interglacial recorded in isotopically dated speleothems from the Alps, Quaternary Sci. Rev., 27, 476–496, https://doi.org/10.1016/j.quascirev.2007.11.005, 2008. Mickler, P. J., Stern, L. A., and Banner, J. L.: Large kinetic isotope effects in modern speleothems Large kinetic isotope effects in modern speleothems, Geol. Soc. Am. Bull., 118, 65–81, https://doi.org/10.1130/B25698.1, 2006. Moerman, J. W., Cobb, K. M., Adkins, J. F., Sodemann, H., Clark, B., and Tuen, A. A.: Diurnal to interannual rainfall δ18O variations in northern Borneo driven by regional hydrology, Earth Planet. Sci. Lett., 369–370, 108–119, https://doi.org/10.1016/j.epsl.2013.03.014, 2013. Moerman, J. W., Cobb, K. M., Partin, J. W., Meckler, A. N., Carolin, S. A., Adkins, J. F., Lejau, S., Malang, J., Clark, B., and Tuen, A. A.: Transformation of ENSO-related rainwater to dripwater δ 18 O variability by vadose water mixing, Geophys. Res. Lett., 41, 7907–7915, https://doi.org/10.1002/2014GL061696, 2014. Moreno, A., Stoll, H., Jiménez-Sánchez, M., Cacho, I., Valero-Garcés, B., Ito, E., and Edwards, R. L.: A speleothem record of glacial (25–11.6kyr BP) rapid climatic changes from northern Iberian Peninsula, Global Planet. Change, 71, 218–231, https://doi.org/10.1016/j.gloplacha.2009.10.002, 2010. Moseley, G. E., Spötl, C., Svensson, A., Cheng, H., Brandstätter, S., and Edwards, R. L.: Multi-speleothem record reveals tightly coupled climate between central Europe and Greenland during Marine Isotope Stage 3, Geology, 42, 1043–1046, https://doi.org/10.1130/g36063.1, 2014. Moseley, G. E., Spötl, C., Cheng, H., Boch, R., Min, A., and Edwards, R. L.: Termination-II interstadial/stadial climate change recorded in two stalagmites from the north European Alps, Quaternary Sci. Rev., 127, 229–239, https://doi.org/10.1016/j.quascirev.2015.07.012, 2015. Moseley, G. E., Edwards, R. L., Wendt, K. A., Cheng, H., Dublyansky, Y., Lu, Y., Boch, R., and Spotl, C.: Reconciliation of the Devils Hole climate record with orbital forcing, Science, 351, 165–168, https://doi.org/10.1126/science.aad4132, 2016. Muñoz, A., Bartolomé, M., Muñoz, A., Sancho, C., Moreno, A., Hellstrom, J. C., Osácar, M. C., and Cacho, I.: Solar influence and hydrological variability during the Holocene from a speleothem annual record (Molinos Cave, NE Spain), Terra Nov., 27, 300–311, https://doi.org/10.1111/ter.12160, 2015. Neff, U., Burns, S. J., Mangini, A., Mudelsee, M., Fleitmann, D., and Matter, A.: Strong coherence between solar variability and the monsoon in Oman between 9 and 6 kyr ago, Nature, 411, 290–293, https://doi.org/10.1038/35077048, 2001. Nehme, C., Verheyden, S., Noble, S. R., Farrant, A. R., Sahy, D., Hellstrom, J., Delannoy, J. J., and Claeys, P.: Reconstruction of MIS 5 climate in the central Levant using a stalagmite from Kanaan Cave, Lebanon, Clim. Past, 11, 1785–1799, https://doi.org/10.5194/cp-11-1785-2015, 2015. Nehme, C., Verheyden, S., Breitenbach, S. F. M., Gillikin, D. P., Verheyden, A., Cheng, H., Edwards, R. L., Hellstrom, J., Noble, S. R., Farrant, A. R., Sahy, D., Goovaerts, T., Salem, G., and Claeys, P.: Climate dynamics during the penultimate glacial period recorded in a speleothem from Kanaan Cave, Lebanon (central Levant), Quaternary Res., 90, 10–25, https://doi.org/10.1017/qua.2018.18, 2018. Novello, V. F., Cruz, F. W., Karmann, I., Burns, S. J., Stríkis, N. M., Vuille, M., Cheng, H., Lawrence Edwards, R., Santos, R. V, Frigo, E., and Barreto, E. A. S.: Multidecadal climate variability in Brazil's Nordeste during the last 3000 years based on speleothem isotope records, Geophys. Res. Lett., 39, L23706, https://doi.org/10.1029/2012GL053936, 2012. Novello, V. F., Vuille, M., Cruz, F. W., Stríkis, N. M., de Paula, M. S., Edwards, R. L., Cheng, H., Karmann, I., Jaqueto, P. F., Trindade, R. I. F., Hartmann, G. A., and Moquet, J. S.: Centennial-scale solar forcing of the South American Monsoon System recorded in stalagmites, Sci. Rep., 6, 24762, https://doi.org/10.1038/srep24762, 2016. Novello, V. F., Cruz, F. W., Vuille, M., Stríkis, N. M., Edwards, R. L., Cheng, H., Emerick, S., de Paula, M. S., Li, X., Barreto, E. de S., Karmann, I., and Santos, R. V: A high-resolution history of the South American Monsoon from Last Glacial Maximum to the Holocene, Sci. Rep., 7, 44267, https://doi.org/10.1038/srep44267, 2017. Onac, B. P., Constantin, S., Lundberg, J., and Lauritzen, S.-E.: Isotopic climate record in a Holocene stalagmite from Ursilor Cave (Romania), J. Quaternary Sci., 17, 319–327, https://doi.org/10.1002/jqs.685, 2002. Orland, I. J., Bar-Matthews, M., Kita, N. T., Ayalon, A., Matthews, A., and Valley, J. W.: Climate deterioration in the Eastern Mediterranean as revealed by ion microprobe analysis of a speleothem that grew from 2.2 to 0.9 ka in Soreq Cave, Israel, Quaternary Res., 71, 27–35, https://doi.org/10.1016/j.yqres.2008.08.005, 2009. Orland, I. J., Bar-Matthews, M., Ayalon, A., Matthews, A., Kozdon, R., Ushikubo, T., and Valley, J. W.: Seasonal resolution of Eastern Mediterranean climate change since 34 ka from a Soreq Cave speleothem, Geochim. Cosmochim. Acta, 89, 240–255, https://doi.org/10.1016/j.gca.2012.04.035, 2012. Oster, J. L., Montañez, I. P., Sharp, W. D., and Cooper, K. M.: Late Pleistocene California droughts during deglaciation and Arctic warming, Earth Planet. Sci. Lett., 288, 434–443, https://doi.org/10.1016/j.epsl.2009.10.003, 2009. Oster, J. L., Montañez, I. P., Santare, L. R., Sharp, W. D., Wong, C., and Cooper, K. M.: Stalagmite records of hydroclimate in central California during termination 1, Quaternary Sci. Rev., 127, 199–214, https://doi.org/10.1016/j.quascirev.2015.07.027, 2015. Partin, J. W., Cobb, K. M., Adkins, J. F., Clark, B., and Fernandez, D. P.: Millennial-scale trends in west Pacific warm pool hydrology since the Last Glacial Maximum, Nature, 449, 452–455, https://doi.org/10.1038/nature06164, 2007. Partin, J. W., Quinn, T. M., Shen, C.-C., Emile-Geay, J., Taylor, F. W., Maupin, C. R., Lin, K., Jackson, C. S., Banner, J. L., Sinclair, D. J., and Huh, C.-A. : Multidecadal rainfall variability in South Pacific Convergence Zone as revealed by stalagmite geochemistry, Geology, 41, 1143–1146, https://doi.org/10.1130/g34718.1, 2013a. Partin, J. W., Cobb, K. M., Adkins, J. F., Tuen, A. A., and Clark, B.: Trace metal and carbon isotopic variations in cave dripwater and stalagmite geochemistry from northern Borneo, Geochemistry, Geophys. Geosystems, 14, 3567–3585, https://doi.org/10.1002/ggge.20215, 2013b. Pérez-Mejías, C., Moreno, A., Sancho, C., Bartolomé, M., Stoll, H., Cacho, I., Cheng, H., and Edwards, R. L.: Abrupt climate changes during Termination III in Southern Europe, P. Natl. Acad. Sci. USA, 114, 10047–10052, https://doi.org/10.1073/pnas.1619615114, 2017. Plagnes, V., Causse, C., Genty, D., Paterne, M., and Blamart, D.: A discontinuous climatic record from 187 to 74 ka from a speleothem of the Clamouse Cave (south of France), Earth Planet. Sci. Lett., 201, 87–103, https://doi.org/10.1016/s0012-821x(02)00674-x, 2002. Pollock, A. L., van Beynen, P. E., DeLong, K. L., Polyak, V., and Asmerom, Y.: A speleothem-based mid-Holocene precipitation reconstruction for West-Central Florida, The Holocene, 27, 987–996, https://doi.org/10.1177/0959683616678463, 2016. Polyak, V. J. and Asmerom, Y.: Late Holocene Climate and Cultural Changes in the Southwestern United States, Science, 294, 148–151, https://doi.org/10.1126/science.1062771, 2001. Polyak, V. J., Asmerom, Y., Burns, S. J., and Lachniet, M. S.: Climatic backdrop to the terminal Pleistocene extinction of North American mammals, Geology, 40, 1023–1026, https://doi.org/10.1130/g33226.1, 2012. Ponte, J. M., Font, E., Veiga-Pires, C., Hillaire-Marcel, C., and Ghaleb, B.: The effect of speleothem surface slope on the remanent magnetic inclination, J. Geophys. Res.-Sol. Ea., 122, 4143–4156, https://doi.org/10.1002/2016jb013789, 2017. Psomiadis, D., Dotsika, E., Albanakis, K., Ghaleb, B., and Hillaire-Marcel, C.: Speleothem record of climatic changes in the northern Aegean region (Greece) from the Bronze Age to the collapse of the Roman Empire, Palaeogeogr. Palaeocl., 489, 272–283, https://doi.org/10.1016/j.palaeo.2017.10.021, 2018. Railsback, L. B., Liang, F., Vidal Romaní, J. R., Grandal-d'Anglade, A., Vaqueiro Rodríguez, M., Santos Fidalgo, L., Fernández Mosquera, D., Cheng, H., and Edwards, R. L.: Petrographic and isotopic evidence for Holocene long-term climate change and shorter-term environmental shifts from a stalagmite from the Serra do Courel of northwestern Spain, and implications for climatic history across Europe and the Mediterranean, Palaeogeogr. Palaeocl., 305, 172–184, https://doi.org/10.1016/j.palaeo.2011.02.030, 2011. Raza, W., Ahmad, S. M., Lone, M. A., Shen, C.-C., Sarma, D. S., and Kumar, A.: Indian summer monsoon variability in southern India during the last deglaciation: Evidence from a high resolution stalagmite δ18O record, Palaeogeogr. Palaeocl., 485, 476–485, https://doi.org/10.1016/j.palaeo.2017.07.003, 2017. Repinski, P., Holmgren, K., Lauritzen, S. E., and Lee-Thorp, J. A.: A late Holocene climate record from a stalagmite, Cold Air Cave, Northern Province, South Africa, Palaeogeogr. Palaeocl., 150, 269–277, https://doi.org/10.1016/s0031-0182(98)00223-5, 1999. Ridley, H. E., Asmerom, Y., Baldini, J. U. L., Breitenbach, S. F. M., Aquino, V. V, Prufer, K. M., Culleton, B. J., Polyak, V., Lechleitner, F. A., Kennett, D. J., Zhang, M., Marwan, N., Macpherson, C. G., Baldini, L. M., Xiao, T., Peterkin, J. L., Awe, J., and Haug, G. H.: Aerosol forcing of the position of the intertropical convergence zone since ad 1550, Nat. Geosci., 8, 195–200, https://doi.org/10.1038/ngeo2353, 2015. Rudzka, D., McDermott, F., Baldini, L. M., Fleitmann, D., Moreno, A., and Stoll, H.: The coupled δ13C-radiocarbon systematics of three Late Glacial/early Holocene speleothems; insights into soil and cave processes at climatic transitions, Geochim. Cosmochim. Acta, 75, 4321–4339, https://doi.org/10.1016/j.gca.2011.05.022, 2011. Rudzka, D., Mcdermott, F., and Surić, M.: A late Holocene climate record in stalagmites from Modrič Cave (Croatia), J. Quaternary Sci., 27, 585–596, https://doi.org/10.1002/jqs.2550, 2012. Salomons, W. and Mook, W. G.: Isotope geochemistry of carbonates in the weathering zone, in Handbook of environmental isotope geochemistry, 239–269, 1986. Schmidt, G. A., LeGrande, A. N., and Hoffmann, G.: Water isotope expressions of intrinsic and forced variability in a coupled ocean-atmosphere model, J. Geophys. Res., 112, D10103, https://doi.org/10.1029/2006JD007781, 2007. Schmidt, G. A., Annan, J. D., Bartlein, P. J., Cook, B. I., Guilyardi, E., Hargreaves, J. C., Harrison, S. P., Kageyama, M., LeGrande, A. N., Konecky, B., Lovejoy, S., Mann, M. E., Masson-Delmotte, V., Risi, C., Thompson, D., Timmermann, A., Tremblay, L.-B., and Yiou, P.: Using palaeo-climate comparisons to constrain future projections in CMIP5, Clim. Past, 10, 221–250, https://doi.org/10.5194/cp-10-221-2014, 2014. Scholz, D. and Hoffmann, D. L.: StalAge – An algorithm designed for construction of speleothem age models, Quat. Geochronol., 6, 369–382, https://doi.org/10.1016/J.QUAGEO.2011.02.002, 2011. Scroxton, N., Burns, S. J., McGee, D., Hardt, B., Godfrey, L. R., Ranivoharimanana, L., and Faina, P.: Hemispherically in-phase precipitation variability over the last 1700 years in a Madagascar speleothem record, Quaternary Sci. Rev., 164, 25–36, https://doi.org/10.1016/j.quascirev.2017.03.017, 2017. Shah, A. M., Morrill, C., Gille, E. P., Gross, W. S., Anderson, D. M., Bauer, B. A., Buckner, R., and Hartman, M.: Global Speleothem Oxygen Isotope Measurements Since the Last Glacial Maximum, Dataset Pap. Geosci., 2013, 1–9, https://doi.org/10.7167/2013/548048, 2013. Shakun, J. D., Burns, S. J., Fleitmann, D., Kramers, J., Matter, A., and Al-Subary, A.: A high-resolution, absolute-dated deglacial speleothem record of Indian Ocean climate from Socotra Island, Yemen, Earth Planet. Sci. Lett., 259, 442–456, https://doi.org/10.1016/j.epsl.2007.05.004, 2007. Shakun, J. D., Burns, S. J., Clark, P. U., Cheng, H., and Edwards, R. L.: Milankovitch-paced Termination II in a Nevada speleothem?, Geophys. Res. Lett., 38, L18701, https://doi.org/10.1029/2011GL048560, 2011. Siklósy, Z., Demény, A., Vennemann, T. W., Pilet, S., Kramers, J., Leél-Össy, S., Bondár, M., Shen, C.-C., and Hegner, E.: Bronze Age volcanic event recorded in stalagmites by combined isotope and trace element studies, Rapid Commun. Mass Spectrom., 23, 801–808, https://doi.org/10.1002/rcm.3943, 2009. Sinha, A., Cannariato, K. G., Stott, L. D., Li, H.-C., You, C.-F., Cheng, H., Edwards, R. L., and Singh, I. B.: Variability of Southwest Indian summer monsoon precipitation during the Bølling-Ållerød, Geology, 33, 813–816, https://doi.org/10.1130/G21498.1, 2005. Sinha, A., Cannariato, K. G., Stott, L. D., Cheng, H., Edwards, R. L., Yadava, M. G., Ramesh, R., and Singh, I. B.: A 900-year (600 to 1500 A.D.) record of the Indian summer monsoon precipitation from the core monsoon zone of India, Geophys. Res. Lett., 34, L16707, https://doi.org/10.1029/2007gl030431, 2007. Sinha, A., Berkelhammer, M., Stott, L., Mudelsee, M., Cheng, H., and Biswas, J.: The leading mode of Indian Summer Monsoon precipitation variability during the last millennium, Geophys. Res. Lett., 38, L15703, https://doi.org/10.1029/2011gl047713, 2011. Sinha, A., Kathayat, G., Cheng, H., Breitenbach, S. F. M., Berkelhammer, M., Mudelsee, M., Biswas, J., and Edwards, R. L.: Trends and oscillations in the Indian summer monsoon rainfall over the last two millennia, Nat. Commun., 6, 6309, https://doi.org/10.1038/ncomms7309, 2015. Sletten, H. R., Railsback, L. B., Liang, F., Brook, G. A., Marais, E., Hardt, B. F., Cheng, H., and Edwards, R. L.: A petrographic and geochemical record of climate change over the last 4600years from a northern Namibia stalagmite, with evidence of abruptly wetter climate at the beginning of southern Africa's Iron Age, Palaeogeogr. Palaeocl., 376, 149–162, https://doi.org/10.1016/j.palaeo.2013.02.030, 2013. Smart, P. L. and Friederich, H.: Water movement and storage in the unsaturated zone of a maturely karstified carbonate aquifer, Mendip Hills, England, in Proceedings of the Environmental Problems in Karst Terranes and their Solutions Conference, 57–87, available at: https://ci.nii.ac.jp/naid/10012582404/ (last access: 29 January 2018), 1987. Sone, T., Kano, A., Okumura, T., Kashiwagi, K., Hori, M., Jiang, X., and Shen, C.-C.: Holocene stalagmite oxygen isotopic record from the Japan Sea side of the Japanese Islands, as a new proxy of the East Asian winter monsoon, Quaternary Sci. Rev., 75, 150–160, https://doi.org/10.1016/j.quascirev.2013.06.019, 2013. Spötl, C. and Mangini, A.: Stalagmite from the Austrian Alps reveals Dansgaard-Oeschger events during isotope stage 3: Implications for the absolute chronology of Greenland ice cores, Earth Planet. Sci. Lett., 203, 507–518, https://doi.org/10.1016/S0012-821X(02)00837-3, 2002. Spötl, C., Fairchild, I. J., and Tooth, A. F.: Cave air control on dripwater geochemistry, Obir Caves (Austria): Implications for speleothem deposition in dynamically ventilated caves, Geochim. Cosmochim. Acta, 69, 2451–2468, https://doi.org/10.1016/j.gca.2004.12.009, 2005. Spötl, C., Mangini, A., and Richards, D. A.: Chronology and paleoenvironment of Marine Isotope Stage 3 from two high-elevation speleothems, Austrian Alps, Quaternary Sci. Rev., 25, 1127–1136, https://doi.org/10.1016/j.quascirev.2005.10.006, 2006. Spötl, C., Scholz, D., and Mangini, A.: A terrestrial U∕Th-dated stable isotope record of the Penultimate Interglacial, Earth Planet. Sci. Lett., 276, 283–292, https://doi.org/10.1016/j.epsl.2008.09.029, 2008. Springer, G. S., Rowe, H. D., Hardt, B., Cheng, H., and Edwards, R. L.: East central North America climates during marine isotope stages 3-5, Geophys. Res. Lett., 41, 3233–3237, https://doi.org/10.1002/2014gl059884, 2014. Steen-Larsen, H. C., Risi, C., Werner, M., Yoshimura, K., and Masson-Delmotte, V.: Evaluating the skills of isotope-enabled general circulation models against in situ atmospheric water vapor isotope observations, J. Geophys. Res.-Atmos., 122, 246–263, https://doi.org/10.1002/2016JD025443, 2017. Stevenson, C., Lee-Thorp, J. A., and Holmgren, K.: A 3000-year isotopic record from a stalagmite in Cold Air Cave, Makapansgat Valley, Northern Province, S. Afr. J. Sci., 95, 46–48, available at: https://journals.co.za/content/sajsci/95/1/AJA00382353_7827 (last access: 30 May 2018), 1999. Strikis, N. M., Cruz, F. W., Cheng, H., Karmann, I., Edwards, R. L., Vuille, M., Wang, X., de Paula, M. S., Novello, V. F., and Auler, A. S.: Abrupt variations in South American monsoon rainfall during the Holocene based on a speleothem record from central-eastern Brazil, Geology, 39, 1075–1078, https://doi.org/10.1130/g32098.1, 2011. Stríkis, N. M., Chiessi, C. M., Cruz, F. W., Vuille, M., Cheng, H., de Souza Barreto, E. A., Mollenhauer, G., Kasten, S., Karmann, I., Edwards, R. L., Bernal, J. P., and Sales, H. dos R.: Timing and structure of Mega-SACZ events during Heinrich Stadial 1, Geophys. Res. Lett., 42, 5477–5484A, https://doi.org/10.1002/2015GL064048, 2015. Sundqvist, H. S., Holmgren, K., and Lauritzen, S.-E.: Stable isotope variations in stalagmites from northwestern Sweden document climate and environmental changes during the early Holocene, The Holocene, 17, 259–267, https://doi.org/10.1177/0959683607073292, 2007. Sundqvist, H. S., Holmgren, K., Moberg, A., Spötl, C., and Mangini, A.: Stable isotopes in a stalagmite from NW Sweden document environmental changes over the past 4000 years, Boreas, 39, 77–86, https://doi.org/10.1111/j.1502-3885.2009.00099.x, 2010. Sundqvist, H. S., Holmgren, K., Fohlmeister, J., Zhang, Q., Matthews, M. B., Spötl, C., and Körnich, H.: Evidence of a large cooling between 1690 and 1740 AD in southern Africa, Sci. Rep., 3, 1767, https://doi.org/10.1038/srep01767, 2013. Talma, A. S. and Vogel, J. C.: Late Quaternary Paleotemperatures Derived from a Speleothem from Cango Caves, Cape Province, South Africa, Quaternary Res., 37, 203–213, https://doi.org/10.1016/0033-5894(92)90082-t, 1992. Tan, L., Cai, Y., Cheng, H., An, Z., and Edwards, R. L.: Summer monsoon precipitation variations in central China over the past 750years derived from a high-resolution absolute-dated stalagmite, Palaeogeogr. Palaeocl., 280, 432–439, https://doi.org/10.1016/j.palaeo.2009.06.030, 2009. Tan, L., Cai, Y., An, Z., Edwards, R. L., Cheng, H., Shen, C.-C., and Zhang, H.: Centennial- to decadal-scale monsoon precipitation variability in the semi-humid region, northern China during the last 1860 years: Records from stalagmites in Huangye Cave, The Holocene, 21, 287–296, https://doi.org/10.1177/0959683610378880, 2010. Treble, P. C., Baker, A., Ayliffe, L. K., Cohen, T. J., Hellstrom, J. C., Gagan, M. K., Frisia, S., Drysdale, R. N., Griffiths, A. D., and Borsato, A.: Hydroclimate of the Last Glacial Maximum and deglaciation in southern Australia's arid margin interpreted from speleothem records (23–15 ka), Clim. Past, 13, 667–687, https://doi.org/10.5194/cp-13-667-2017, 2017. Tremaine, D. M., Froelich, P. N., and Wang, Y.: Speleothem calcite farmed in situ: Modern calibration of δ18O and δ13C paleoclimate proxies in a continuously-monitored natural cave system, Geochim. Cosmochim. Acta, 75, 4929–4950, https://doi.org/10.1016/J.GCA.2011.06.005, 2011. Ünal-İmer, E., Shulmeister, J., Zhao, J.-X., Tonguç Uysal, I., Feng, Y.-X., Duc Nguyen, A., and Yüce, G.: An 80 kyr-long continuous speleothem record from Dim Cave, SW Turkey with paleoclimatic implications for the Eastern Mediterranean, Sci. Rep., 5, 13560, https://doi.org/10.1038/srep13560, 2015. Vaks, A., Bar-Matthews, M., Ayalon, A., Schilman, B., Gilmour, M., Hawkesworth, C. J., Frumkin, A., Kaufman, A., and Matthews, A.: Paleoclimate reconstruction based on the timing of speleothem growth and oxygen and carbon isotope composition in a cave located in the rain shadow in Israel, Quaternary Res., 59, 182–193, https://doi.org/10.1016/s0033-5894(03)00013-9, 2003. Vansteenberge, S., Verheyden, S., Cheng, H., Edwards, R. L., Keppens, E., and Claeys, P.: Paleoclimate in continental northwestern Europe during the Eemian and early Weichselian (125–97 ka): insights from a Belgian speleothem, Clim. Past, 12, 1445–1458, https://doi.org/10.5194/cp-12-1445-2016, 2016. Voarintsoa, N. R. G., Wang, L., Railsback, L. B., Brook, G. A., Liang, F., Cheng, H., and Edwards, R. L.: Multiple proxy analyses of a U∕Th-dated stalagmite to reconstruct paleoenvironmental changes in northwestern Madagascar between 370CE and 1300CE, Palaeogeogr. Palaeocl., 469, 138–155, https://doi.org/10.1016/j.palaeo.2017.01.003, 2017a. Voarintsoa, N. R. G., Brook, G. A., Liang, F., Marais, E., Hardt, B., Cheng, H., Edwards, R. L., and Railsback, L. B.: Stalagmite multi-proxy evidence of wet and dry intervals in northeastern Namibia: Linkage to latitudinal shifts of the Inter-Tropical Convergence Zone and changing solar activity from AD 1400 to 1950, The Holocene, 27, 384–396, https://doi.org/10.1177/0959683616660170, 2017b. Voarintsoa, N. R. G., Railsback, L. B., Brook, G. A., Wang, L., Kathayat, G., Cheng, H., Li, X., Edwards, R. L., Rakotondrazafy, A. F. M., and Madison Razanatseheno, M. O.: Three distinct Holocene intervals of stalagmite deposition and nondeposition revealed in NW Madagascar, and their paleoclimate implications, Clim. Past, 13, 1771–1790, https://doi.org/10.5194/cp-13-1771-2017, 2017c. Vogel, J. C.: 14C Variations During the Upper Pleistocene, Radiocarbon, 25, 213–218, https://doi.org/10.1017/s0033822200005506, 1983. Vogel, J. C. and Kronfeld, J.: Calibration of Radiocarbon Dates for the Late Pleistocene Using U∕Th Dates on Stalagmites, Radiocarbon, 39, 27–32, https://doi.org/10.1017/s003382220004087x, 1997. Wagner, J. D. M., Cole, J. E., Beck, J. W., Patchett, P. J., Henderson, G. M., and Barnett, H. R.: Moisture variability in the southwestern United States linked to abrupt glacial climate change, Nat. Geosci., 3, 110–113, https://doi.org/10.1038/ngeo707, 2010. Wainer, K., Genty, D., Blamart, D., Hoffmann, D., and Couchoud, I.: A new stage 3 millennial climatic variability record from a SW France speleothem, Palaeogeogr. Palaeocl., 271, 130–139, https://doi.org/10.1016/j.palaeo.2008.10.009, 2009. Wainer, K., Genty, D., Blamart, D., Daëron, M., Bar-Matthews, M., Vonhof, H., Dublyansky, Y., Pons-Branchu, E., Thomas, L., van Calsteren, P., Quinif, Y., and Caillon, N.: Speleothem record of the last 180 ka in Villars cave (SW France): Investigation of a large δ18O shift between MIS6 and MIS5, Quaternary Sci. Rev., 30, 130–146, https://doi.org/10.1016/j.quascirev.2010.07.004, 2011. Wang, X., Auler, A. S., Edwards, R. L., Cheng, H., Cristalli, P. S., Smart, P. L., Richards, D. A., and Shen, C.-C.: Wet periods in northeastern Brazil over the past 210 kyr linked to distant climate anomalies, Nature, 432, 740–743, https://doi.org/10.1038/nature03067, 2004. Wang, X., Edwards, R. L., Auler, A. S., Cheng, H., Kong, X., Wang, Y., Cruz, F. W., Dorale, J. A., and Chiang, H.-W.: Hydroclimate changes across the Amazon lowlands over the past 45,000 years, Nature, 541, 204–207, https://doi.org/10.1038/nature20787, 2017. Wang, Y., Cheng, H., Edwards, R. L., Kong, X., Shao, X., Chen, S., Wu, J., Jiang, X., Wang, X., and An, Z.: Millennial- and orbital-scale changes in the East Asian monsoon over the past 224,000 years, Nature, 451, 1090–1093, https://doi.org/10.1038/nature06692, 2008. Wang, Y. J.: A High-Resolution Absolute-Dated Late Pleistocene Monsoon Record from Hulu Cave, China, Science, 294, 2345–2348, https://doi.org/10.1126/science.1064618, 2001. Wassenburg, J. A., Dietrich, S., Fietzke, J., Fohlmeister, J., Jochum, K. P., Scholz, D., Richter, D. K., Sabaoui, A., Spötl, C., Lohmann, G., Andreae, M., and Immenhauser, A.: Reorganization of the North Atlantic Oscillation during early Holocene deglaciation, Nat. Geosci., 9, 602–605, https://doi.org/10.1038/ngeo2767, 2016. Webster, J. W., Brook, G. A., Railsback, L. B., Cheng, H., Edwards, R. L., Alexander, C., and Reeder, P. P.: Stalagmite evidence from Belize indicating significant droughts at the time of Preclassic Abandonment, the Maya Hiatus, and the Classic Maya collapse, Palaeogeogr. Palaeocl., 250, 1–17, https://doi.org/10.1016/j.palaeo.2007.02.022, 2007. Werner, M., Langebroek, P. M., Carlsen, T., Herold, M., and Lohmann, G.: Stable water isotopes in the ECHAM5 general circulation model: Toward high-resolution isotope modeling on a global scale, J. Geophys. Res.-Atmos., 116, D15109, https://doi.org/10.1029/2011JD015681, 2011. Whittaker, T. E.: High-resolution speleothem-based palaeoclimate records from New Zealand reveal robust teleconnection to North Atlantic during MIS 1-4, PhD Thesis, The University of Waikato, available at: https://hdl.handle.net/10289/2575 (last access: 2 February 2018), 2008. Whittaker, T. E., Hendy, C. H., and Hellstrom, J. C.: Abrupt millennial-scale changes in intensity of Southern Hemisphere westerly winds during marine isotope stages 2–4, Geology, 39, 455–458, https://doi.org/10.1130/G31827.1, 2011. Williams, P. W., King, D. N. T., Zhao, J.-X., and Collerson, K. D.: Speleothem master chronologies: combined Holocene 18O and 13C records from the North Island of New Zealand and their palaeoenvironmental interpretation, The Holocene, 14, 194–208, https://doi.org/10.1191/0959683604hl676rp, 2004. Williams, P. W., King, D. N. T., Zhao, J.-X., and Collerson, K. D.: Late Pleistocene to Holocene composite speleothem 18O and 13C chronologies from South Island, New Zealand – did a global Younger Dryas really exist?, Earth Planet. Sci. Lett., 230, 301–317, https://doi.org/10.1016/j.epsl.2004.10.024, 2005. Winter, A., Miller, T., Kushnir, Y., Sinha, A., Timmermann, A., Jury, M. R., Gallup, C., Cheng, H., and Edwards, R. L.: Evidence for 800 years of North Atlantic multi-decadal variability from a Puerto Rican speleothem, Earth Planet. Sci. Lett., 308, 23–28, https://doi.org/10.1016/j.epsl.2011.05.028, 2011. Wong, C. I., Banner, J. L., and Musgrove, M.: Holocene climate variability in Texas, USA: An integration of existing paleoclimate data and modeling with a new, high-resolution speleothem record, Quaternary Sci. Rev., 127, 155–173, https://doi.org/10.1016/j.quascirev.2015.06.023, 2015. Wortham, B. E., Wong, C. I., Silva, L. C. R., McGee, D., Montañez, I. P., Troy Rasbury, E., Cooper, K. M., Sharp, W. D., Glessner, J. J. G., and Santos, R. V: Assessing response of local moisture conditions in central Brazil to variability in regional monsoon intensity using speleothem 87Sr/86Sr values, Earth Planet. Sci. Lett., 463, 310–322, https://doi.org/10.1016/j.epsl.2017.01.034, 2017. Yoshimura, K., Kanamitsu, M., Noone, D., and Oki, T.: Historical isotope simulation using Reanalysis atmospheric data, J. Geophys. Res.-Atmos., 113, D19108, https://doi.org/10.1029/2008JD010074, 2008. Yuan, D.: Timing, Duration, and Transitions of the Last Interglacial Asian Monsoon, Science, 304, 575–578, https://doi.org/10.1126/science.1091220, 2004. Zanchetta, G., Regattieri, E., Isola, I., Drysdale, R. N., Bini, M., Baneschi, I., and Hellstrom, J. C.: The so-called “4.2 event” in the central Mediterranean and its climatic teleconnections, Alp. Mediterr. Quat., 29, 5–17, available at: http://amq.aiqua.it/index.php/issues-2012-2017/alpine-and-mediterranean-quaternary-29-1-2016/12-the-so-called-4-2-event-in-the-central-mediterranean-and- its-climatic-teleconnections (last access: 15 January 2018), 2016. Zhang, T.-T., Li, T.-Y., Cheng, H., Edwards, R. L., Shen, C.-C., Spötl, C., Li, H.-C., Han, L.-Y., Li, J.-Y., Huang, C.-X., and Zhao, X.: Stalagmite-inferred centennial variability of the Asian summer monsoon in southwest China between 58 and 79 ka BP, Quaternary Sci. Rev., 160, 1–12, https://doi.org/10.1016/j.quascirev.2017.02.003, 2017. Zhou, H., Zhao, J., Zhang, P., Shen, C.-C., Chi, B., Feng, Y., Lin, Y., Guan, H., and You, C.-F.: Decoupling of stalagmite-derived Asian summer monsoon records from North Atlantic temperature change during marine oxygen isotope stage 5d, Quaternary Res., 70, 315–321, https://doi.org/10.1016/j.yqres.2008.04.007, 2008.